Guide in 'Crafting & Gathering' published by Caimie Tsukino, Aug 11, 2015. Ch31: Can I level just a single class? What class(es) should I level first? 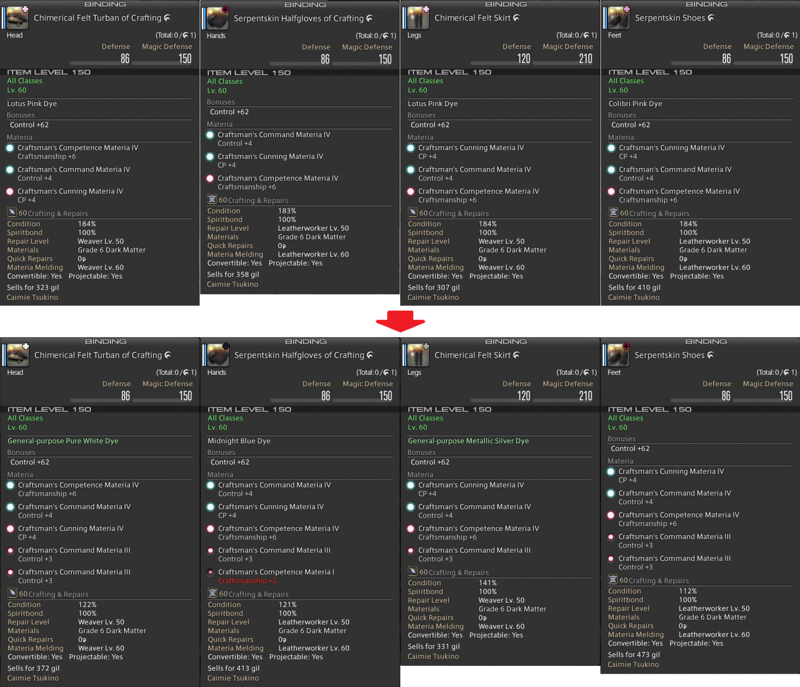 Ch46: How to effectively craft 35 durab items in Heavensward? Much like battle classes, all Heavensward crafting contents are beyond level 50 (with the exception of the new battle classes that starts from lvl 30). 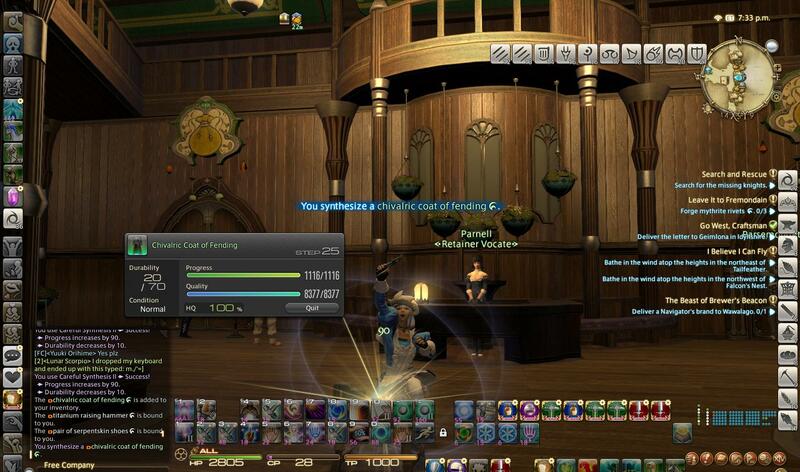 Thus, this guide is designed to accommodate crafters post-lvl 50. If you are not level 50 yet, please visit the original Caimie's Crafting Guide (Part 1). It contains information to help you understand about crafting, cross class skills, construction of rotations and ways of leveling. If you do not have Careful Syn II, Ingenuity II and Byregot's Blessing yet, please acquire them before moving beyond lvl 50. 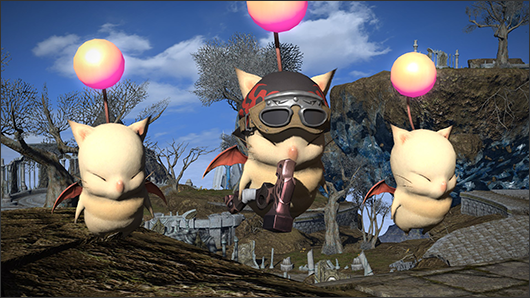 In this guide (Part 3), we will only be focusing on the new contents added in the Heavensward expansion, which substitutes the outdated end-game contents in ARR (covered in Caimie's Crafting Guide Part 2). If you are a gatherer, and is looking for a gathering guide, please visit my Heavensward gathering guide here. Unfortunately, ALL classes should be leveled to gain an advantage. 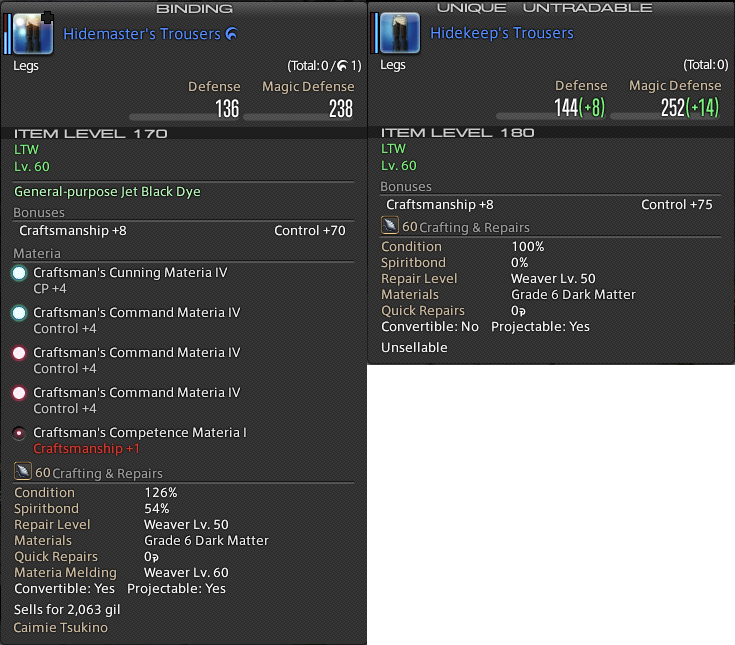 Much like A Realm Reborn (ARR), all Heavensward (HW) recipes require mats from multiple classes. So having more classes can greatly save gil from buying crafted mats. Gathering classes & Retainers will also help a lot with acquisition of raw mats. Technically, you CAN just level a single class, but it will cost you a lot of gil. In addition, before the release of HW, S-E said you don’t need to level all classes, but can just choose to level a single class, and still able to excel and make high level items. It’s not a lie, but it’s close to a lie. The new Whistle system & Specialization Crafting Skills indeed give a chance for single-class crafters to do any end-game item. But that new Whistle system is very luck-dependent, and not very reliable. So, most level 50 cross class skills are still needed. Together with other reasons, I recommend being an all-60 after all. 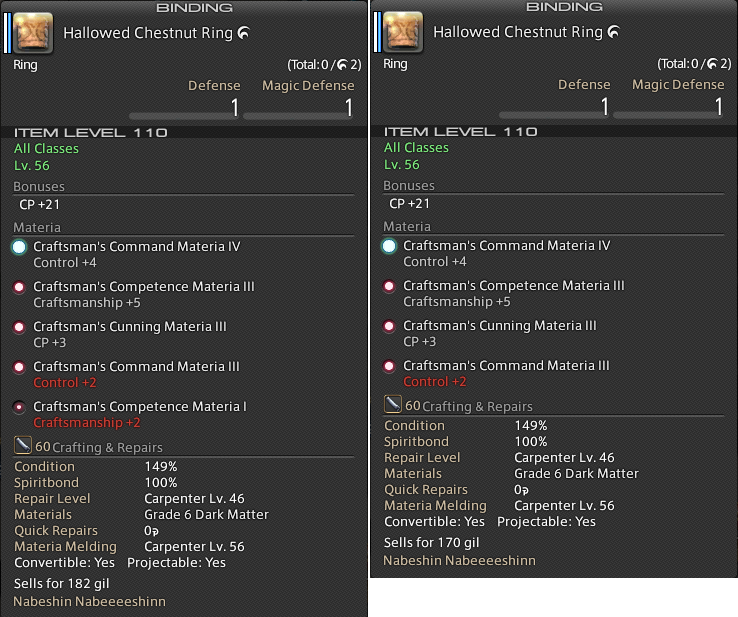 (1) CRP – it makes most of the primary HW end-game accessories (notice that it’s NOT GSM anymore in HW), which can be worn at lvl 56 (Hallowed Chestnut Ring), 58 (Hallowed Chestnut Armillae) & 59 (Hallowed Chestmut Necklace). CP is the KEY to success, thus gaining early access to these accessories is very important. I would even suggest to overmeld them as early as possible to further boost your craft/control/CP. CRP also makes the offhand tools for WVR & GSM. So it's definitely a high priority to level CRP. (2) BSM – it makes most of the mainhand / offhand tools that you’ll need (apart from WVR, CUL & ALC mainhands). (3) WVR – makes crafting/gathering gear - lvl 53 crafting/gathering gloves, chests, pants. lvl 53 crafting shoes. lvl 54 crafting belt. lvl 55 crafting hat, chest, pants. WVR also makes your initial end-game crafting hat, chest, pants, and initial end-game gathering pants. (4) LTW – makes crafting/gathering gear - lvl 51 crafting/gathering gloves, chests, pants, boots. lvl 53 gathering chest, pants, boots. lvl 55 gathering hat, chest, gloves, boots. lvl 55 crafting gloves, boots. LTW also makes your gathering belts, and your initial end-game crafting/gathering gloves, boots & belts, and initial end-game gathering chest & hat. GSM now only makes 1 primary HW end-game accessory, which are the Dragon Fang Earrings (can be worn at lvl 57). So of course it's not as important as it used to be in ARR. 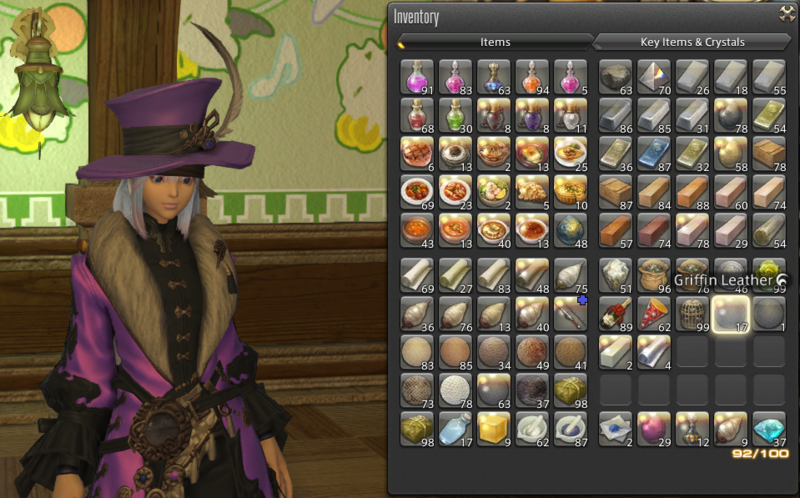 However, things like Hardsilver Ingot & Aurum Regis Nugget are used in a lot of recipes. GSM also makes the mainhand tools for WVR, and the crafting/gathering head piece for lvl 51. So it really doesn’t hurt to have GSM leveled early too. 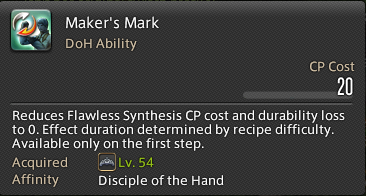 GSM lvl 54 also gives “Maker’s Mark”, which is a pretty good cross class skill to be used with Flawless Synthesis, and is something that can be used to assist the new Whistle System (see later chapters below). ARM is good to provide CUL & ALC mainhand tools. CUL gives the new cross class skill “Muscle Memory” at lvl 54 (see later chapters for details), which is very good for crafting any 70 or 80 durab items above level 57. 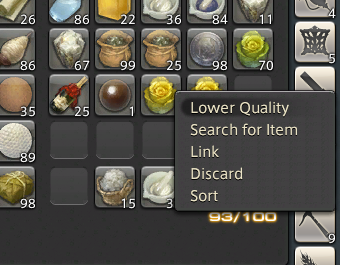 New food like “Baked Onion Soup HQ”, are also very strong and helpful (although if you have already stocked up with Bouillabaisse HQ from ARR, they work very nicely too). It gives slightly more CP than the old Bouillabaisse HQ, and also provides that extra craftsmanship that sometimes can be critical in completing certain items with 1 less Careful Syn II. ALC is a funny one. Basically, you need crafted mats from ALC all the times when you’re leveling other classes. So you’re “forced” to level this. Personally, my ALC reached level 58 without even doing a single leves. I had to constantly use it to craft things to power other classes. Apart from DoH classes, it's also quite important to level up some DoL classes like Miner and Botanist, which can save yourself a lot of gil from buying mats off the market board. Make sure you level up at least 1 retainer as a DoW/DoM (same as your lvl 60 main) and at least 1 retainer as Miner or Botanist (Personally, I think Miner retainer is more helpful post-lvl 56, but Botanist retainer is still very helpful from lvl 50 to 55.). Retainer ventures can sometimes get you free mats more efficient than yourself! 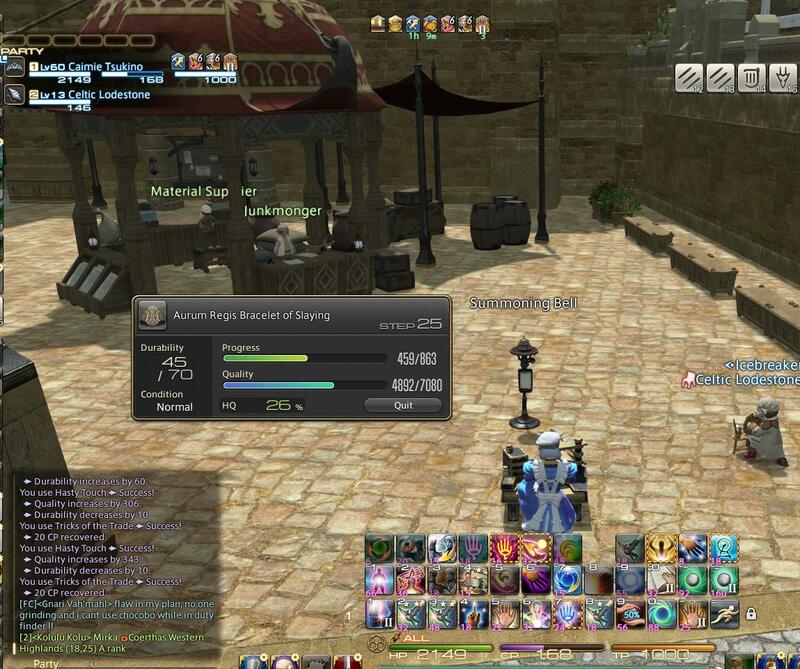 In Heavensward (post lvl 50), your retainers can trained up to the same level as your character. Similar to ARR, there are many ways to level your crafting classes, and I recommend using a combination of them. First of all, every day you should consume 5 to 6 Tradecraft Leves to keep that total allowance lower than 100. This allows extra leves to flow in each day. This should be a top priority every day. However, if you're between level 50 to level 52, DO NOT overuse leves too early. You want to save most of your leves for your higher levels. At lvl 55+, you should be doing more leves, and at lvl 58+, you should be massively grinding leves. Now, which leves? In a recent patch, they have strongly nerfed the exp from level 45 leves in Adventure Guilds of all 3 major cities. So don't bother with them anymore. Someone did say the Mor Dhona leves still works ok (but I haven't confirmed). 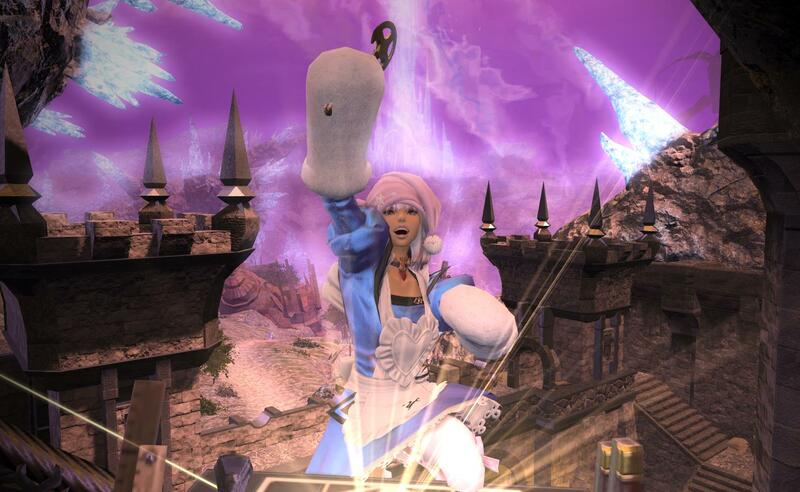 But anyway, if you're level 50, you should be taking level 50 leves from Foundation (near the big aetheryte). (1) Avoid any leves that asks for more than 1 item. This sort of leves give good exp per leves, and they maximize allowances, but they deplete your mats way too fast, and will get you broke in no time. I recommend leves that only ask for 1 item. (2) Usually there will be 2 choices, so find out what mats is needed for the 2 leves items. Are they expensive? Pick the one that uses fewer mats, or uses cheaper mats. (3) Pay attention to the "Recipe Level". Avoid taking on recipes higher than your own levels. By now you should be able to distinguish "Recipe Level" from "Item Level". There are 3 kinds of "levels" you have to deal with. "Recipe Level" is listed on the crafting log but NOT on the item itself. It determines the difficulty of the item for the crafter. "Item Level" (a.k.a. ilvl) is listed ON the item. It contributes to the final "average ilevel" when the item is being worn, and each ilvl has its own melding cap. And the "Level" listed below the "classes" ON the item refers to the "Minimum level of that class to wear the item". When I said pay attention to "Recipe Level", I mean the information on the crafting log, not the item itself. E.g. if the Recipe Level is 54, then you should not be attempting to make it when you're only level 51. You can do it, but it'll be very difficult to HQ it. Level 51 should be able to take on a level 51 recipe with ease, and perhaps level 52 too. 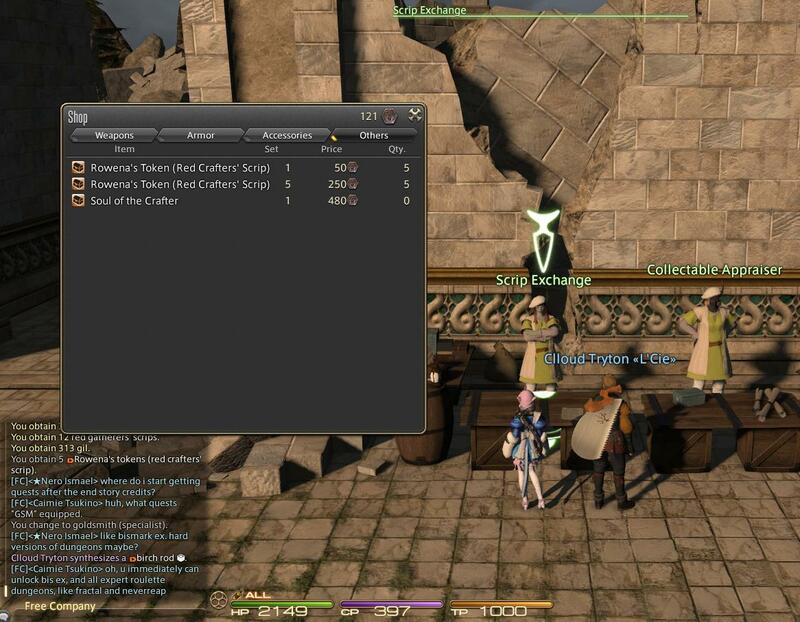 - Avoid recipes with higher Recipe Levels than your current crafting class's level. After selecting your leves, try your best to craft and hand in HQ items to double the exp. This will save you money and leves allowances. The only time(s) you would hand in NQ items, is if the NQ finished product is actually very cheaply available on marketboard (MB), much cheaper than buying the mats. Alternatively, you're trying to take on a leves item of a recipe lvl much higher than your own crafter's level, so you know you have trouble making it HQ. Or if you have so many allowances to spare, you just feel like burning them. Then ok, go ahead and turn in NQ stuff for your leves. The new “Collectable System” allows you to gain exp by turning in requested items. I will give you a more detailed explanation about how this system works in the later chapters. This method gives less exp than leves. But it is a viable alternative if you run out of leves. Surprisingly, this is perhaps the most effective way of leveling. If the item has a gold star, you should try your best to hand in an HQ item (unless the mats are so expensive it's just out of your budget). Starred items give 2x exp. HQ items give 2x exp. Handing in an HQ item when the item is starred would give 4x EXP. That’s one single item for almost half the exp bar. So don’t miss your daily GC turn-ins. Now, with all those GC seals from turn-ins, you should buy "Company-Issued Engineering Manual". We will discuss this below. 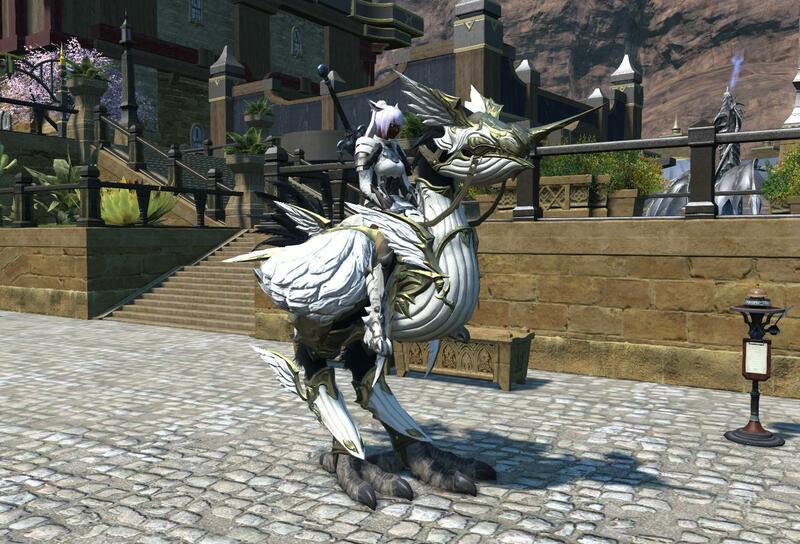 - You also get this really cool mount when you complete the Moogle Beast Tribe! 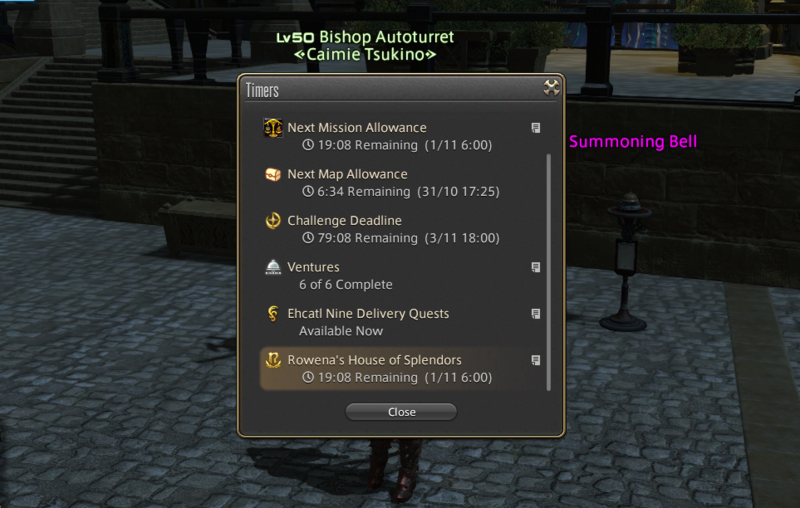 In Heavensward, when you take up your "continued" class quests from the corresponding crafting classes' guilds, you will be given 3x "Commercial Engineering Manual" per class. DO NOT waste them. They provide a bonus of 150% exp and up to 300,000 exp, but it only lasts 20 min. Save these precious manuals for later use (like level 55+). Instead, go buy "Company-Issued Engineering Manual" with GC seals (1440 seals each). 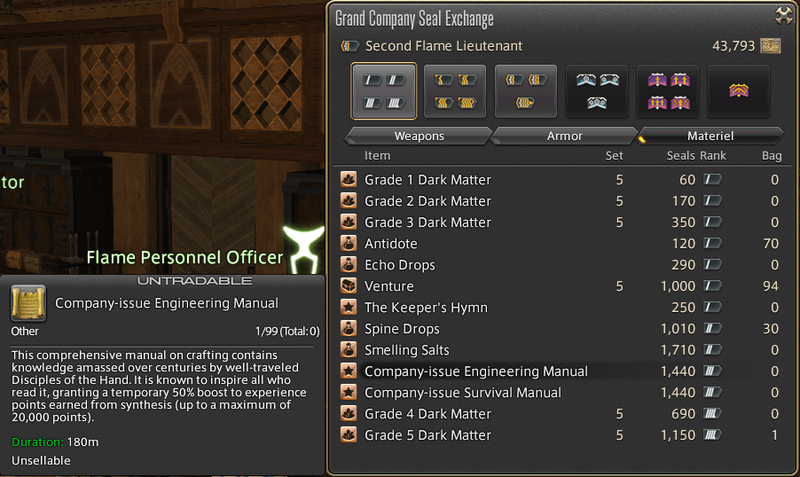 These manuals are much more affordable since you'll have plenty of GC seals from doing GC Supply/Provision Mission. These weaker manuals provides only a bonus of 50% exp and 20,000 exp max before vanishing. But they last up to 3 hours, so you can take your time with your crafting. Despite the smaller exp it gives, it's a great thing to use for level 50 to level 54 crafting. I always popped one when I was massively grinding HQ 1 star 40 durab items (see below). Since the "Commercial Engineering Manual" has only 20 min, you cannot utilize the 300K bonus exp quick enough if you're crafting HQ items manually (even with macro). So, use the precious Commercial manuals when you're doing quicksyn at level 55+. Quicksyn will allow you to fully use up all the bonus 300K exp before the 20 min mark. - 3x free Commercial Engineering Manual are given per class at the beginning of every class quest in HW. Only 3 per class, so use them wisely on Quisksyn. They can also be purchased with Blue Scrips (see later chapters below about Blue Scrips). But I do not recommend wasting your Blue Scrips on them. - Buy "Company-Issued Engineering Manual" to handle your daily crafting of HQ items. Much like ARR, this is one of the most solid way to level crafting. To effectively do this, you should be using any cheap CP food like Stone Soup from the Gold Saucer to add CP advantage and gain the extra 3% exp. You should be using the Company-Issued Engineering Manual mentioned above. And if possible, you should request FC buff on crafting exp. *Requires 324 Craftsmanship if you're level 50. Requires only 294 Craftsmanship if you're level 51! *Requires 349 CP - modify the rotation to use less CP as you see fit. 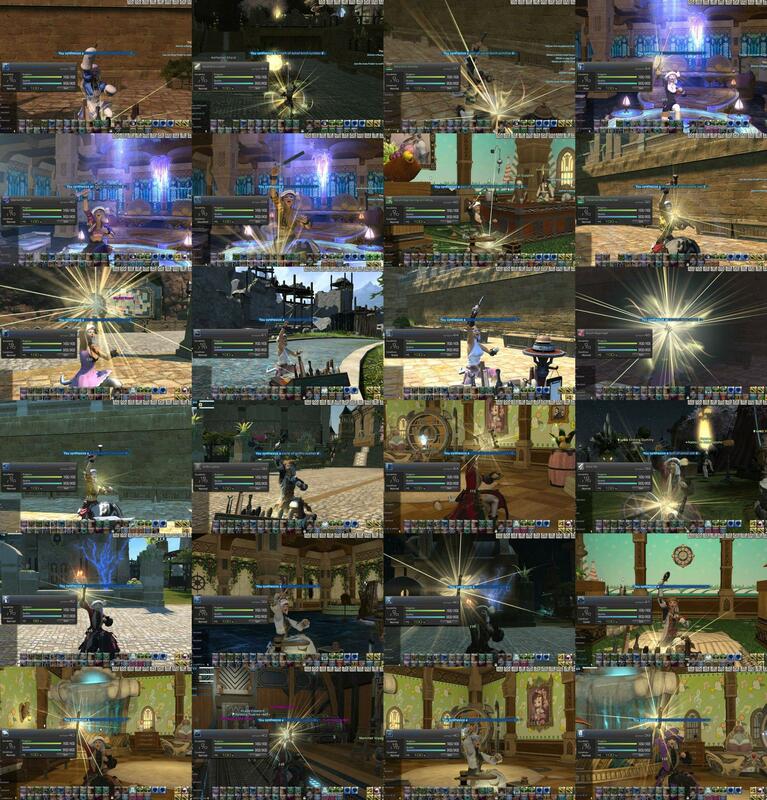 Developed by Sensei Nabeshin & a few other crafters back in 2.0, and extensively studied and modified by me, this rotation was the ultimate rotation for 1 star & 2 star 40 durab items in ARR. I am sure other strong crafters out there would have come to a consensus of the same rotation too (so it's hard to say who "invented" it). This rotation reaches only IQ6, but it gives 100% HQ rate for 1 star 40 durab items made from pure NQ mats (from quality zero). At that time, we were only using the original lvl 50 class quest mainhand tools, fully-melded Militia offhands & fully-melded i55 AF gear. We didn't even had 349 CP (the accessories introduced in Patch 2.3 later made a big difference). Sensei Nabeshin pushed craftsmanship to its limit by pentamelding his offhand, and substituted Ingen2 with Ingen1 to buy just enough CP for the Standard Touch. As for me, I had a high control offhand build instead of high craftsmanship, so I couldn't use Ingen1 to complete the item in one-shot. Thus, I substituted Standard Touch with Basic Touch, and used SH II instead of SH to create a rotation that needed only 338 CP. And then I used strong control food to make up the difference. Alternatively, I used a cheap CP food so that I could hit 349 CP to use Ingen2. The beauty of this rotation is that it combined the best lvl 50 skills of multiple classes, and arranged everything so perfectly to maximize the power of every action and to utilize almost every CP. It doesn't contain any Hasty Touch, so there will not be any failed steps. In addition, the rotation perfectly fits the maximum 15 lines of a macro, so you can perform the macro with just 1 button. Furthermore, it was also a flexible rotation in manual crafting, where you can delay on the use of Manip by 1 step, and touch earlier if a "Good" condition pops on the Manip step. You can also skip Ingen2 or Innovation to do the Standard Touch first if an early "Good" appears. 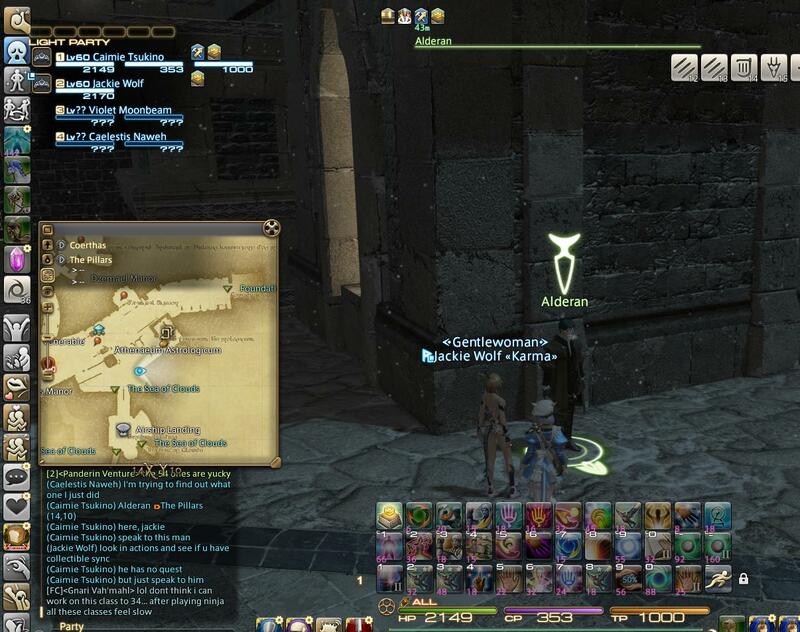 It was the "Diamond Rotation" that lasted over a year of A Realm Reborn. It definitely qualifies as the “Rotation of the Year”! Today, in HW, this ultimate rotation still has its place. Crafters these days are all wearing Artisan gear with luxurious overmelded accessories that provides much more stats than the old days, so anyone can easily macro this rotation to massively produce ARR 1 star 40 durab items for exp with a single button. Notice that 2 star 40 durab items actually don’t give that much more exp than 1 star, but the mats are more expensive. So I would avoid those. Also, if you have desynthesis trained up in ARR, you can consider breaking down 1 star 80 durab items, and use the mats to remake those items again for leveling. E.g. if you have GSM desynthesis, you can make "Aetheryte Ring" after making those Rose Gold Nuggets. Each ring only uses 1 nugget. And when you desyn a ring, you get back 1 nugget. So you lose nothing except catalyst. This is one of the easiest ways to level up with minimal cost. One of the classic ways to craft 1 star & 2 star 80 durab items like the Aetheryte Ring, was to modify the ultimate rotation by substituting Manipulation with Waste Not. This is because durability is no more an issue, so Waste Not can be utilized. This modification will use up 10 extra durab, but frees up 32 CP, which you can now put into other uses. Depending on your preference, you can stick with IQ6 for the Byregot, or you can choose to add more touches before the Byregot using the extra CP. … see how we have now increased IQ stack by 2 for the Byregot? We abolished the use of Innovation in this case, but kept Ingen2 so that it covers the last 2 Careful Synthesis II, making us able to complete the item in 2 steps. If you have the extra CP, feel free to add in Innovation before Ingen2, or feel free to substitute the last Basic Touch with Standard Touch. The arrangement of the skills in the Byregot phase was done so that any time when a "Good" or "Excellent", we can react appropriately. E.g. if we did Great Strides first before Steady Hand II, and if an Excellent pops, then our Byregot will only be at 90% success rate. However, if an "Excellent" pops right after SH II in the above arrangement, we can Byregot it right away at 100% success rate. Similarly, if a "Good" pops after we use Great Strides, we can skip Ingen2 and Byregot right away etc. To effectively craft out old ARR 1 star or 2 star 80 durab items for leveling, we can now utilize the following macro. This rotation was developed by Lebensohl when we already obtained Lucis. Our stats were just high enough that we can use a single button to make any 1 star or 2 star 80 durab item HQ from pure NQ mats. The beauty of this rotation is its SPEED. It's only 15 lines, and can be fitted into a single macro. Thus, you can massively produce any 1 or 2 star 80 durab items from NQ mats with a single button. 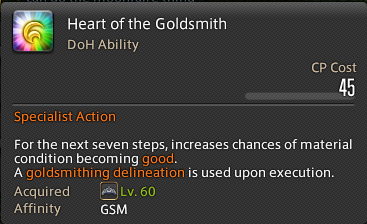 This was the macro I used to make my HQ Aetheryte Rings & Bouillabaisse HQ for leveling GSM & CUL in HW. 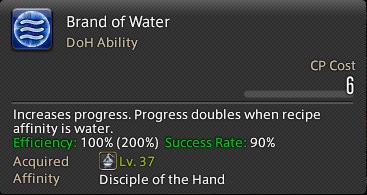 Keep in mind to always pop a food to gain that 3% bonus exp (I recommend the 37 gil Stone Soup from Gold Saucer for the extra 17 CP), use a Company-Issued Engineering Manual, and if possible, and request FC buff on crafting exp if it's available. With all these bonus exp, you will be able to level up pretty quickly. One of the reasons why I leveled this way from level 50 to 52, was because Heavensward mats were expensive when the expansion was first released. But lately the prices are dropping fast, so the mats have become more accessible… to a point which Gold Ore / Darksteel Ore are actually becoming more expensive than Mythrite Sand to make Mythrite Nuggets (or their equivalents in other classes). If that's the case, you may consider switching to Mythrite Sand for massive production of Mythrite Nuggets instead of Rose Gold / Darksteel Nuggets. However, Mythrite Nugget is a level 51 item, so doing it at level 50 will be difficult. You can still do it, but it'll take much longer time. I suggest taking on it after reaching level 51. Keep in mind that in order to take on the new challenges of level 51+ recipes, you can’t just macro everything. The rotation I gave out above are only sufficient for ARR items. To take on HW items, you will need to manual craft first, and rely on a lot of Hasty Touches and use more durab recovery skills like Manipulation, Waste Not and Master’s Mend II. I’m not going to give out these rotations here. I’m sure you can figure out the best for yourself. Yet, at around level 54, you will be able to effectively macro your Mythrite Nugget using that old ultimate rotation. 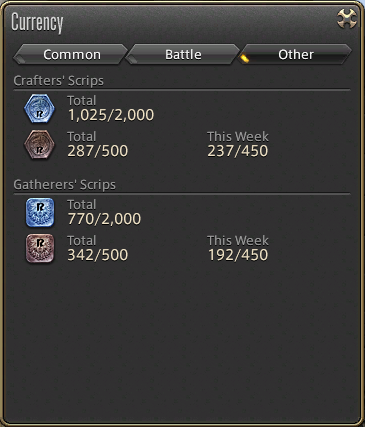 The point of me throwing the above rotations and macros at you, is so that you can effectively and massively make ARR 1 star items to grind that early 50+ levels. Once you passed that point, you should try to develop new rotation & macros to handle the new HW items. If you're undergeared, you may have trouble crafting these Archaeonskin gear yourself. If that's the case, I would recommend you BUYING these gear. Unfortunately, there's no NQ version available from vendors or quests, so you will have to acquire them from a crafter friend or from the marketboard. You can try to do it yourself though if you have faith in your own abilities. Some strong talented crafters can do it themselves despite undergeared. Because of this, I recommend acquiring the old ARR crafting accessories and lightly meld them with Cunning materia (for CP). DO NOT waste your Competence (for Craftsmanship) and Command materia (for Control) at this point. Save them for later! 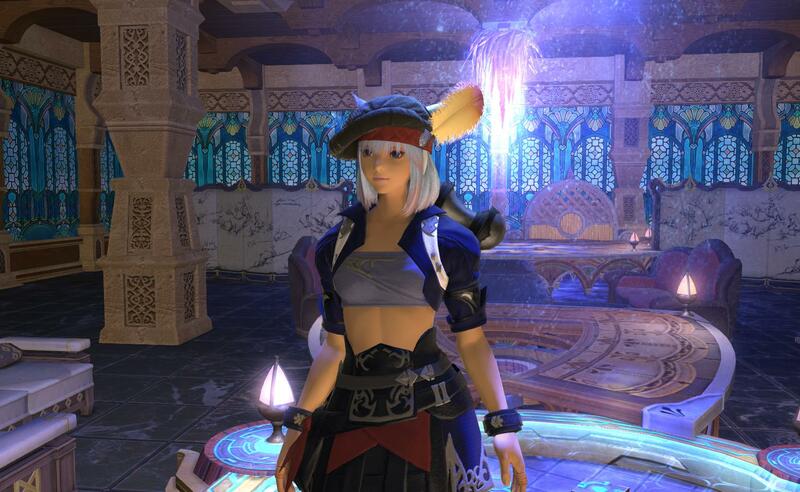 i55 Militia Wristlets and i55 Aetheryte Rings are a MUST for level 50. You really should acquire these items, as they are not that expensive or difficult to make, but they will help bridge the gap between level 50 and level 53+. 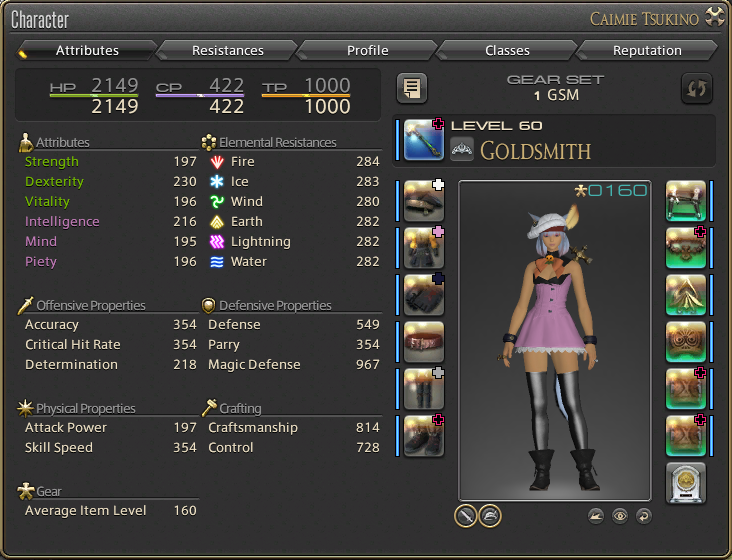 i55 Rose Gold Choker, i55 Mosshorn Earrings and i55 Dodore Belt require demimateria to craft. Thus, they're expensive to acquire. They will help you a lot if you can get them. They can serve their purposes from level 50 to 53, until you reach level 54 which you can equip the i90 Holy Cedar Necklace and i90 Holy Rainbow Apron. However, if you cannot afford them, you can still live with Electrum Choker and Raptorskin Merchant's Purse for the time being. Personally, I do NOT recommend the i55 Mosshorn Earrings that much since it can be replaced soon by i70 Yeti Fang Earrings at level 52 (and this is much cheaper). So you might as well live with the old Red Coral Earrings until you reach level 52. Keep in mind that slightly more CP is usually more beneficial than slightly more Craftsmanship or Control. To minimize cost, it's better to simply meld some Cunning III materia on your temporary accessories (or not meld at all if cost is an issue). Once you have acquired the Archaeoskin Crafting Set and some new Heavensward accessories, you will have successfully transitioned from being an undergeared ARR lvl 50 crafter to a well-geared leveling crafter in HW. As for offhand tools, you can stick with the old Militia Offhand until level 53. If you're an all-50, you should be able to craft your own Militia Offhand even if you're undergeared. New mythrite mainhand tools are available as early as level 52 and new offhand tools are available as early as level 53. If you have BSM leveled up (as I suggested in the earlier chapter), you will be able to make most of your own tools (and CRP makes WVR and GSM offhands). If you have LTW and WVR leveled up, you'll be able to make your own gear. Most importantly, if you have CRP, you can take care of most of your accessories, and your GSM will let you make your earrings. 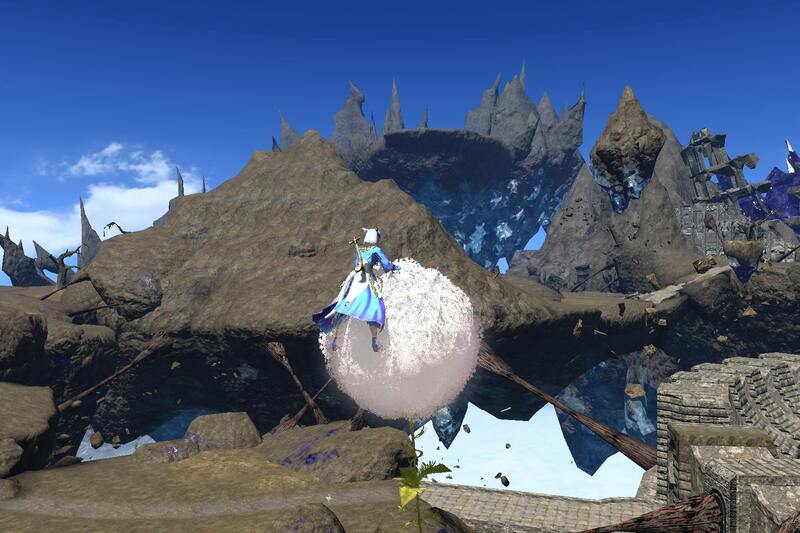 Keep in mind that each level in Heavensward (lvl 50+) is a gigantic leap of powers. For instance, it is very difficult or a level 50 crafter to make lvl 51 recipes like Mythrite Nugget or Cedar Lumber. But once you reach level 51/52 (and assuming you're well-geared), you can pretty much 1 shot it with a Careful Synthesis II under Ingen2. 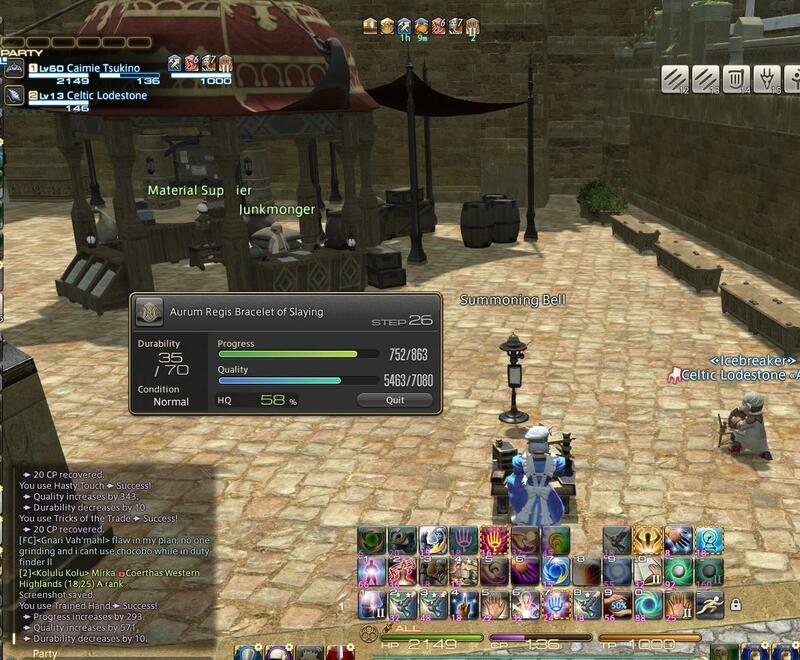 Each time you level up, the old ARR 1 to 4 star items will become significantly easier. By the time you reach level 53/54, you can easily handle ARR 4 star items. The difficulty of an ARR 4 star recipe is identical to that of a level 53 recipe in Heavensward. 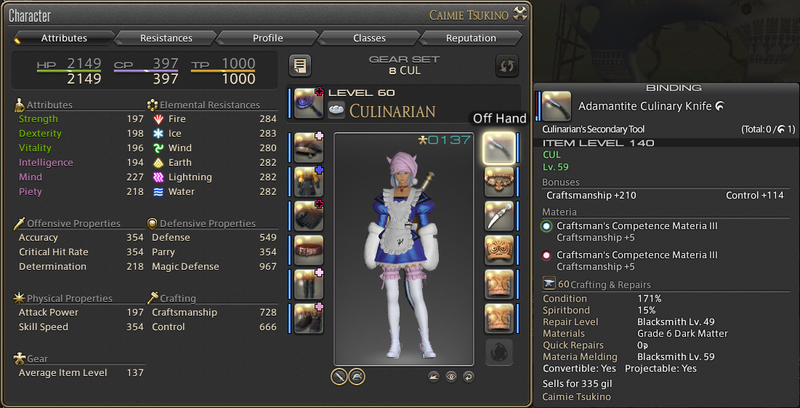 Where as the difficulty of an ARR 3 star recipe is approximately between that of level 51 and level 52 recipe. This is why, in the previous chapter, I recommended all level 50 crafters to take on GC turn-ins, leves and massively craft ARR 1 star items to level up to 51 or 52 before taking on Heavensward recipes. 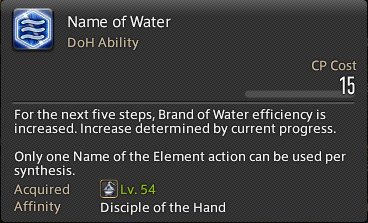 If you have to take on a recipe above your own levels, you may consider using the new Name of [element] skill from HW together with the old Brand of [element] from ARR. They tend to give very good progress even on non-elemental-aspected items. Please see later chapter "Heavensward New Cross Class Skills" below for details. 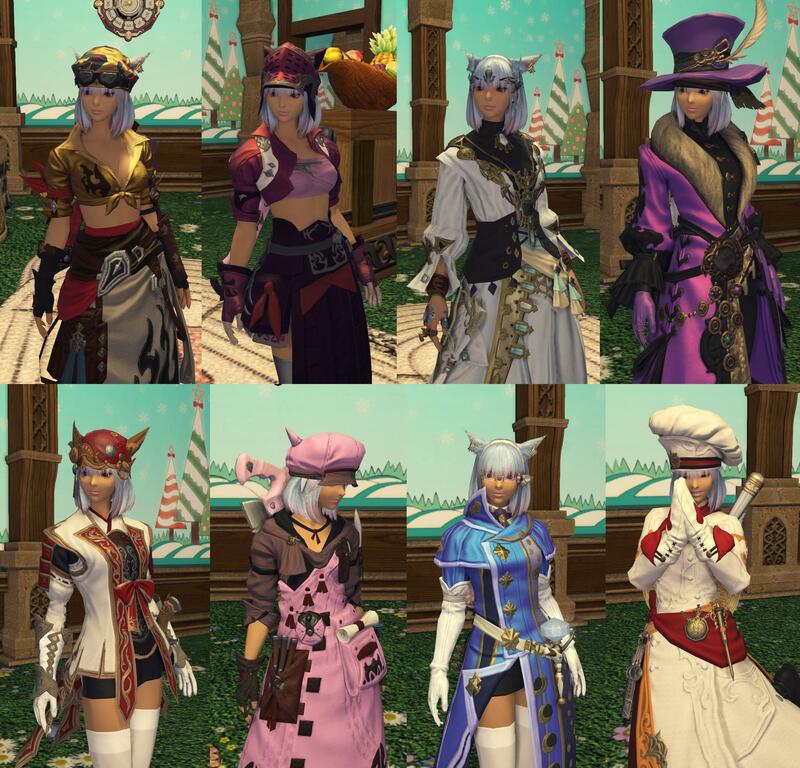 The level 53 NQ crafting gear set (the "Rainbow Crafting Set", made by mostly Weaver) can be obtained mostly by doing level 53 class quests in Heavensward. The level 55 NQ crafting gear set (the "Ramie Crafting Set", made by mostly Weaver) can be obtained also by doing level 55 class quests. It can also be obtained from a Moogle Merchant/Vendor at the Churning Mist. At level 58, you can acquire the Adept Gown using Blue Scrips (Optional. Please see later chapters on Scrips and Adept Gear Set). The level 59/60 NQ adamantite crafting tools can be obtained from a merchant at Dravanian Hinterlands inside the cave near bottom left corner of the map. Although, you should try to obtain HQ ones if possible, since you will be using these for awhile. 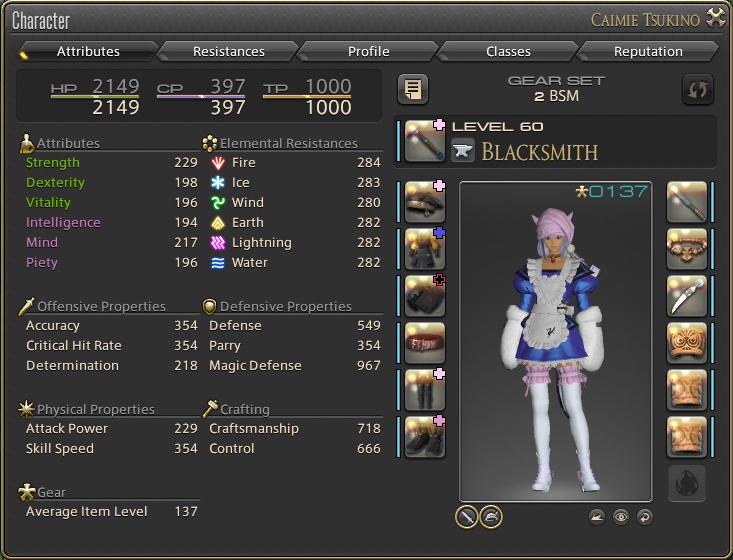 At level 60, you can then acquire the Chimerical Set from Master Recipe III (see later chapters), which is your "Initial End-game Gear", ready for overmelds. As for suggestions on rotations, please see "Ch32E: Leveling by Actual Crafting" and "Ch46: How to effectively craft 35 durab items in Heavensward?" Crafters who are undergeared may not be able to use the macros listed in Ch32E, but one can take the concept from them, and modify them into rotations that can achieve higher IQ stacks with fewer CP. This rotation requires 373 CP. Use a Bouillabaisse if you need. Can't afford so much CP? Try use Master's Mend or Manipulation instead of Master's Mend II, and do fewer touches then! ... Really, just be creative! Do anything you like! Creating rotations is the fun part! Come up with something that works for yourself! In HW, instead of having special “turn-in items” like Spicy Tomato Relish (ARR special 2 star) or Intricate Silver Brocade (ARR special 3 star), we now have “Collectables” for turn-ins. The idea of Collectables is to basically use existing items for turn-ins instead of creating new items for the game. 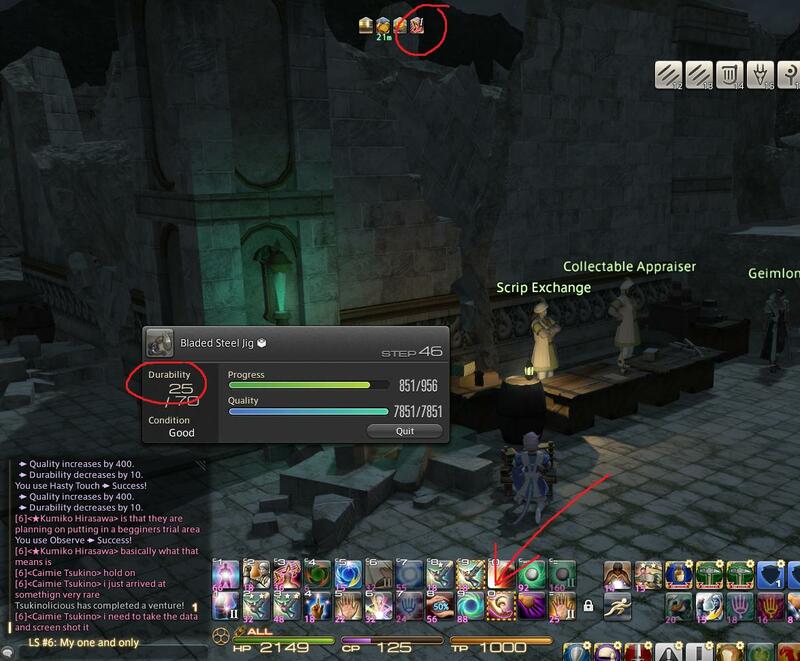 We now have a button called “Collectable Synthesis” which we learn very early in our "continued" lvl 50 class quests. You can turn it on/off any time during your crafting session. When it is on, the item you crafted will become an untradable “Collectable”, and can only be used for turn-ins. Collectable items are also non-stackable. Thus, each Collectable item consumes 1 inventory space. The value of Collectables are measured by “Collectability”, which is a number directly translated from quality. When you press the “Collectable Synthesis” button, the HQ Rate % will not show any numbers anymore (but quality bar will still show the amount of quality). When the item is completed, its collectability will be calculated base on how much quality you managed to push out. The NPC will only accept collectables with sufficient Collectability. Items with insufficient Collectability can still be utilized by right-clicking the item, and using the “Lower Quality” function to turn it into a regular NQ item. - Lower the quality of any Collectable items that are too low in Collectability. It will turn the item into a regular NQ item for sale or consumption. Collectables are to be turned in at the "Collectable Apprasier" NPC at either Mor Dhona or Idyllshire. You can start turning in Collectable items very early, yet you will only get exp but nothing else when you’re lvl 55 or below. I do not recommend this unless you’re already out of leves. After level 56, the collectables you turned in will give you “Blue Crafter's Scrips”. It is basically a “currency” that allows you to buy many items, including Master Recipe III, the Adept Gear Set, Delineation, crafting mats etc. 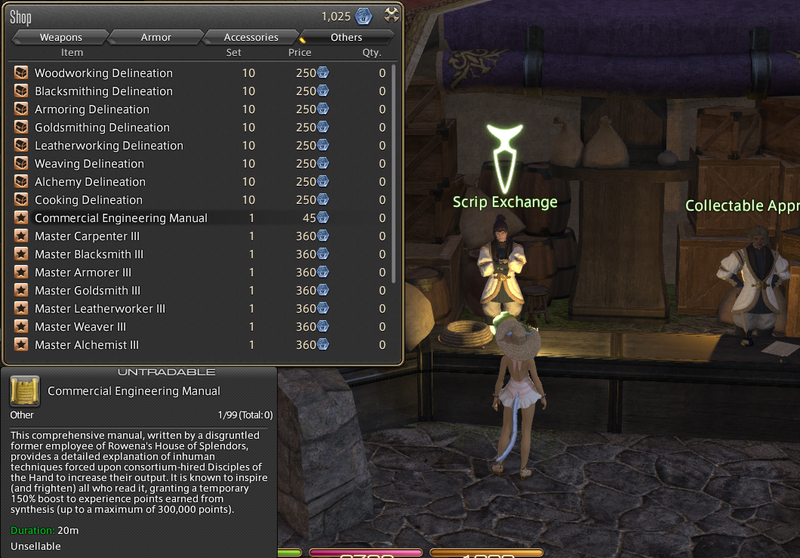 At level 60, you will have access to “Red Crafter's Scrips”. Every 50x Red Crafter's Scrips allow you to purchase 1x “Rowena’s Token (Red Crafter’s Scrip)” (which is a ridiculously long name). Anyway, it’s another currency that allows you to exchange for end-game tools/gear (i180). - Red Scrips are capped at 450 per week. Unlike Esoretics that resets every Tue, scrips reset every Thursday. There are Blue/Red Crafter’s Scrips & Blue/Red Gatherer’s Scrips, and they don’t mix. Crafter’s Scrips are earned via crafting. Gatherer’s Scrips are earned via gathering. The scrips for Disciple of the Hand (DoH) & Disciple of the Land (DoL) are completely separated. At the "Collectable Appraiser", the gold star next to an item indicates more favorable return of scrips per item for that particular day. The bonus scrips are approximately 10%. So the more scrips an item gives, the more that 10% bonus will be. Thus, this works particularly well for non-CUL items, as they give more scrips per item. Coming from ARR, we all know CUL mats are usually cheaper, very gatherable, and not many mats need to be crafted. Thus, we always loved to submit CUL items in the past for turn-ins. However, S-E has now set up it here that CUL gives only 1/4 to 1/5 of the scrips of other classes (axxholes!). So despite CUL mats easier to obtain & cheaper, we have to work 4 to 5 times harder if we’re to submit CUL items for scrips. Anyway, it all comes down to (a) your budget, (b) your access to mats, and (c) your time to choose to submit CUL items or not. Pay attention to the timer at the bottom right of the "Rowena's House of Splendors" panel from the Collectable Appraiser. The items listed on the panel changes every 24 hours. Make sure you have sufficient time to craft and hand in your items before the timer hits zero, or you will be stuck with your collectables, and jam your inventory for days. Also, notice that you can access the same list from ANYWHERE. If you're on a PC, press "Ctrl U" on keyboard, and you will be able to see what items are being requested by the "Rowena's House of Splendors". If you're on PS4, you can also access the same panel from your main menu (logs). 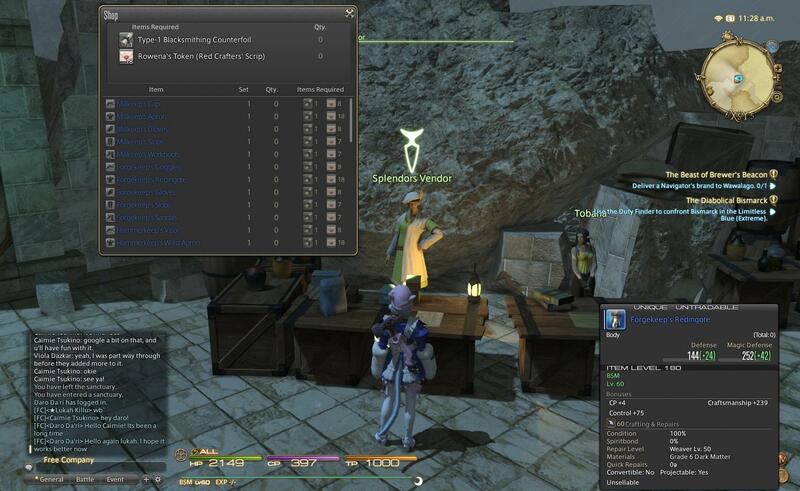 - "Collectable Appraiser" & "Scrip Exchange" NPCs are located at both Mor Dhona & Idyllshire. The Appraiser NPC allows you to turn in Collectables for Blue & Red Scrips at the "Rowena's House of Splendors" panel. Notice the timer at bottom right of the window. The items change every 24 hours. The Scrip Exchange NPC at Mor Dhona allows you to spend Blue Scrips ONLY, while the NPC at Idyllshire allows you to spend both Blue & Red Scrips. Red Scrips are to be spent in exchange for "Rowena's Token (Red Crafter's Scrip)". - One does NOT always need to go to Mor Dhona or Idyllshire to check on what items are being requested from the Collectable Appraiser. If you're on a PC, press "Ctrl U" on your keyboard to open this panel. You can then scroll down, and check the "Rowena's House of Splendors". Both the list of items and the timer can be found there. This can save you the trouble of many unnecessary teleportations. - The Splendor Vendor at Idyllshire allows you to use your "Rowena's Token (Red Crafter's Scrip) to buy i180 crafting tools & gear. 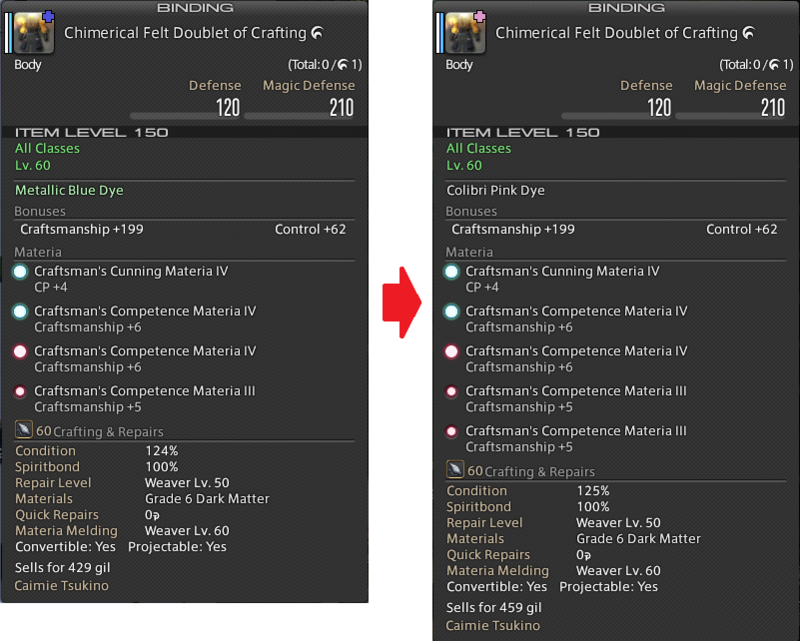 For a comparison between i180 vs the crafted i170 of the same gear, please visit the later chapter below "Tips on Crafting Heavensward 2 Star Items". This new Collectable system does have its advantage for S-E to monitor the game. First, S-E won’t have to create a bunch of special recipes that are of no further use after turn-ins. They can now easily turn any existing items in the game into a turn-in item. Second, S-E can easily modify the difficulty of turn-ins just by changing the numbers for minimum collectability, or the amount of scrips you earn per item. To players, this system also has its advantages and disadvantages. E.g. 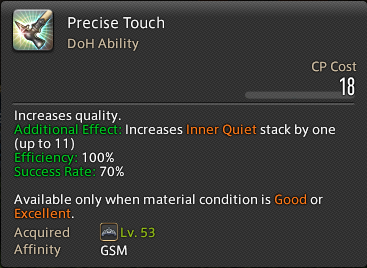 even if you failed to craft something that can be turned in, you can easily use the “Lower Quality” function to change the item back into a normal NQ item for sale or for use. Disadvantage is that if you forget to click that “Collectable Synthesis” button (which happens a lot), you would have crafted a normal HQ item, and it cannot be used for turn-in purpose. Adept gear can be purchased with Blue Scrips, and can be worn as early as level 58. Apart from the chest piece, all other gear will actually make you lose CP & craftsmanship in exchange for the high control. Thus, if you already have the max melded BiS gear (Best in Slot) from ARR, I do NOT recommend you getting anything other than the Adept chest piece. The chest piece is a nice upgrade since you sacrifice only 3 CP, but in exchange for a large amount of craftsmanship & control. Using the Adept chest, you can push WVR strong enough to earn its Master Recipe III, and then craft out the Chimerical end-game gear set for yourself. So the Adept chest is a great choice to serve as a “stepping stone”. 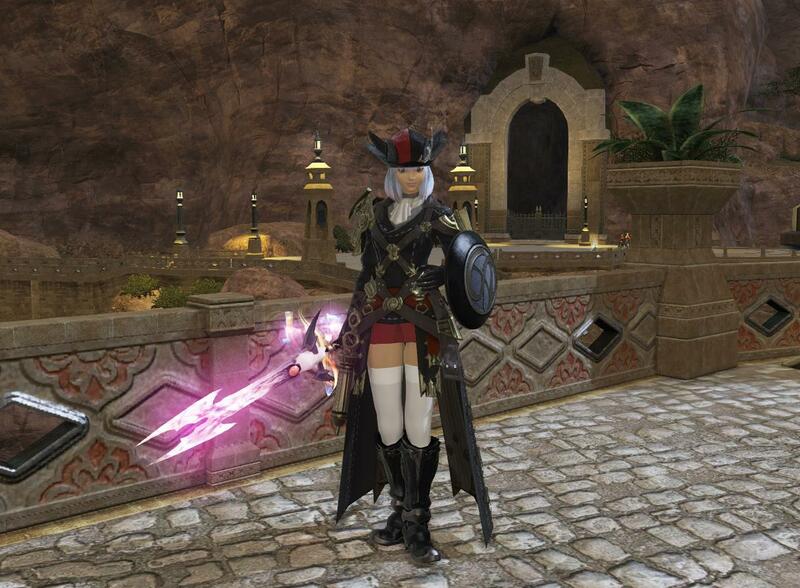 If you DO NOT have BiS from ARR, then perhaps 1 more piece of Adept gear would be of benefit to you. But I would discourage anyone from getting any more than that. - Apart from the Adept's Gown, I do not recommend other Adept's gear if you already have BiS from ARR. 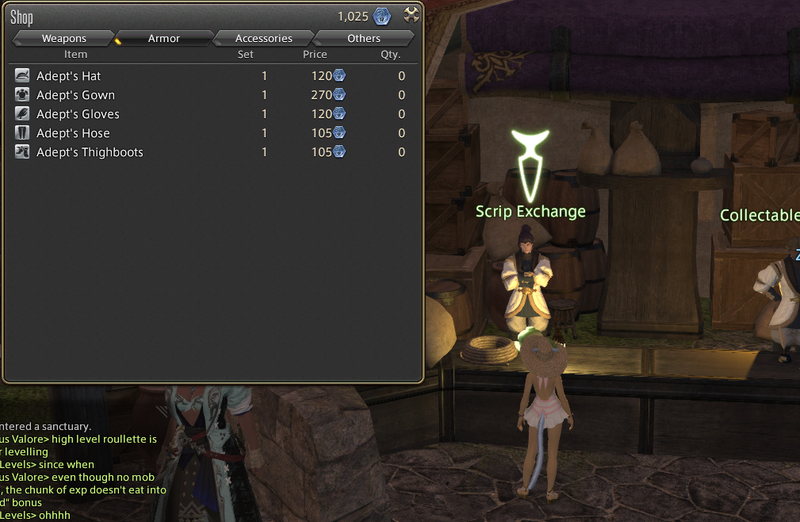 The new HW Master Recipe III can be purchased using Blue Scrips at "Scrip Exchange" NPC of Mor Dhona or Idyllshire. Each Master Recipe III cost 360 Blue Scrips per class. 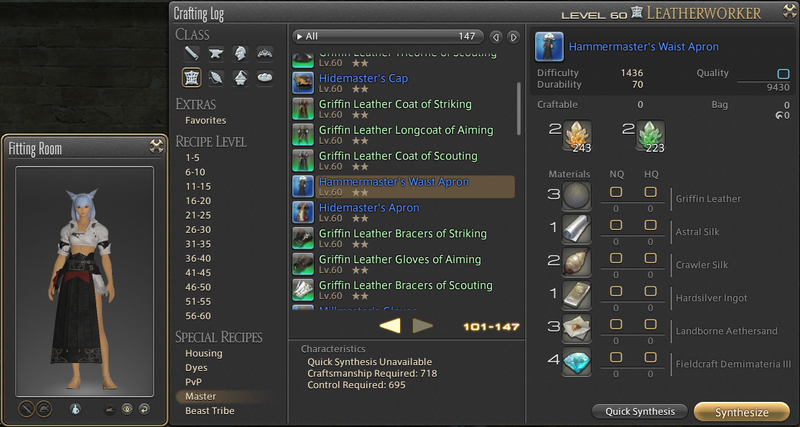 Master Recipe IIIs contain recipes for your initial HW end-game gear & mainhand tools. They also contain class quest items required for level 60 crafting class quests. The recipes also contain many cool items such as exotic minions, bardings & furniture. Master Recipe IIIs also contain 1 star recipes such as Chivalric Coat of Fending / Maiming & Seafood Stew. In Patch 3.07, 2 star recipes have been added. 2 star recipes include i170 gear, such as the Forgemaster's Redingote. 2 star recipes also include mainhand, offhand & accessories for crafting classes (For gathering classes, mainhand & gear are NOT craftable. Only gathering accessories are craftable.). However, 2 star recipes require mats from Favors & Ephemeral Nodes, which is a pain. - 2 star recipes such as the "Forgemaster's Redingote" require mats from Ephemeral Nodes & Favors. Please see my Heavensward Gathering Guide Ch11 & 12 for details. For tips on crafting 1 star & 2 star items, and for a comparison of this i170 vs i180, please visit Ch 46 & 47 of this guide. Your Initial End-game Set is also known as "the White Gear" since your next gear upgrade after this will have a green or blue background. As mentioned in Ch31, I recommend melding the accessories as early as possible, to gain an advantage when you are still leveling. You can start utilizing new rings at lvl 56 (made & melded by CRP), new earrings at lvl 57 (GSM), new bracelet at lvl 58 (CRP) and new belt (LTW) + choker (CRP) at lvl 59. You want to achieve 718 Craftsmanship & 695 Control to access 2 star items. These values, however, cannot be achieved by overmelding alone (well, you CAN, but you will need to heavily meld mainhands and offhands too, for all your classes, which I refuse). The best way is to pair up your overmelds with the use of end-game crafting food to achieve the desired stats. To view a selection of food, please visit the later chapter "Crafting Food in ARR & Heavensward" below. 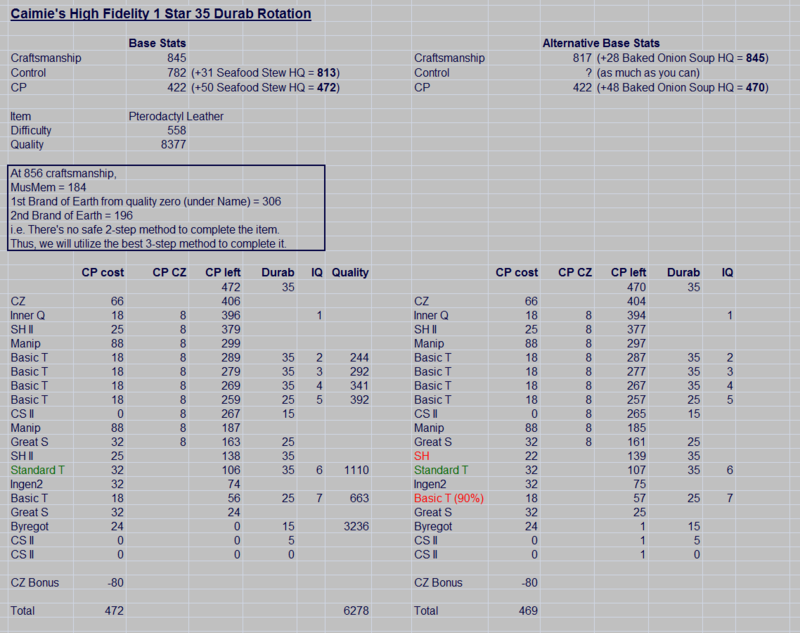 I have chosen to use Seafood Stew HQ (+50 CP, +31 Control) to help me achieve the required Control stats for 2 star items. Thus, my control is lower than the 2 star requirement. When I first started overmelding, it was uncertain what the best way of overmelding was. So as you can see, I did not finished pentamelding my gear... I left some room to meld more stats later (which I did on 25 Aug 2015, see below). 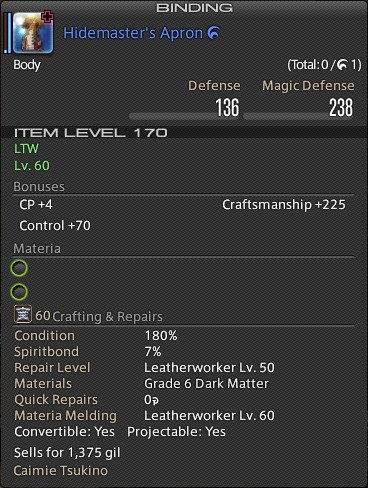 728 Craftsmanship also shortens the completion steps of Marron Glaze by 1 step (Please see the later chapter: Heavensward Crafting Data Sharing). Technically, you just need 725 Craftsmanship to do this for Marron Glaze. But it doesn't hurt to push to 728 so that you're ready for 1 star recipes. At the moment, most of my classes are only sitting on 718 craftsmanship. 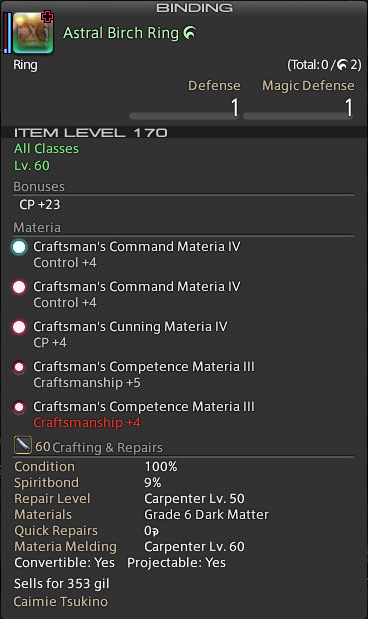 I can use a Baked Onion Soup (see chapter: Crafting Food in ARR & Heavensward) to add more craftsmanship + CP when I do 1 star, but I am considering melding more materia on my shared gear. 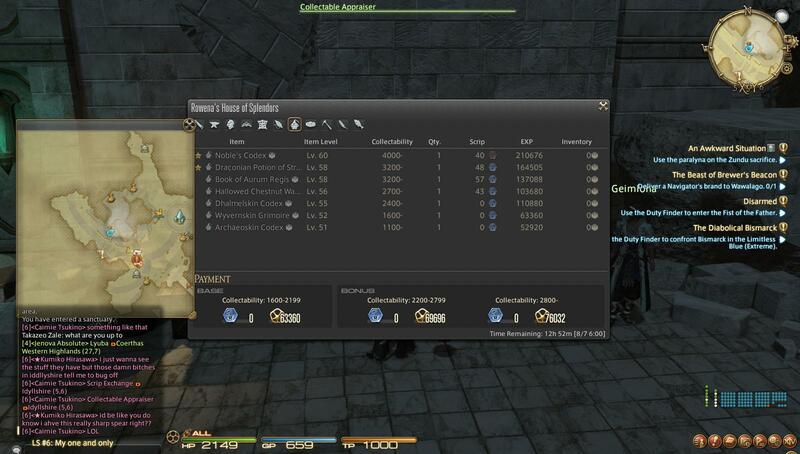 Notice that even the penta-melded gear/accessories of mine did not reach the max melding cap of those items. These Heavensward initial end-game gear/acessories are designed so that one cannot max them unless one uses Tier V materia, which are currently not worth your money. But I have maxed my CP on all shared gear. Because it allows me to be more flexible with rotations. To me, CP > craft/control. With more CP, I can get away with weaker stats. 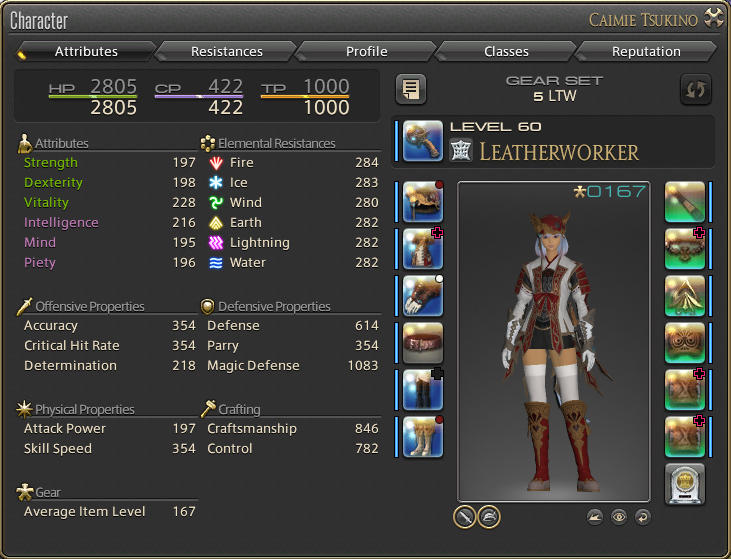 At this point, I have added more materia onto my gear. I have add 5 more Craftsmanship onto my chests (final meld), and completed the last meld on my ring with a +2 Craftsmanship. So my total Craftsmanship is 725 (& 735 for CUL due to offhand melds). As for control, I have added 3 more control onto each of my Hat, Gloves, Pants & Boots. 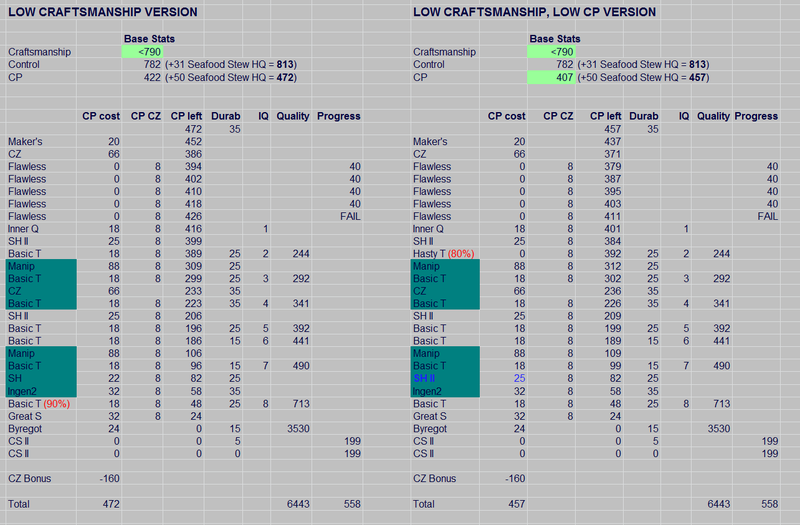 Therefore, my final stats without food is now 725 Craftsmanship, 678 Control, 397 CP for most class. I really wish I can push 3 more Craftsmanship on my shared gear, but the Hat, Gloves, Pants & Boots can only add 2 more Craftsmanship each (only 2 crafts left on the cap). I do not want to do the 5th meld on those gear just to push 2 Craftsmanship. If possible, I want to meld 3 more control on each of them in the future. I feel like this will be a better way to max the cap. So I haven't done any more melds yet. Apparently, if I am to do 2 star, 725 Craftsmanip is sufficient, so I'll eat a Seafood Stew. If I am to do 1 star and needed >728 Crafts, I can simply eat a Baked Onion Soup. So it's not like I need to push my base Craftsmanship stats above 728 with overmelds at the moment. - This pic shows my stats for most of my classes before 25 Aug 2015. This stats was achieved with the overmelds shown in the pictures below. It was very sufficient for 1 star, as long as I eat a Baked Onion Soup. My base CP before food was 397 CP. But I only needed 395 when I eat a NQ Stone Soup for my daily crafting of any none-star items. I only added CP+3 and CP+1 on my mainhand and offhands. It saves me a lot of overmelding work, since my minimum 2 star crafting requirements all come from shared gear. DO NOT follow how I melded these rings! As u can see, Control is capped at 6. Thus, there's no reason to use a Command IV on the first meld, and a +2 Control on a later meld. One could have used 2x Control III instead. Reminder: ALWAYS check the prices of materia, and start from the most expensive to least expensive!!! I recommend pentamelding these rings as early as lvl 56 to gain an advantage of the extra CP they provide. But as you can see, I didn't even finish melding the 2nd ring. That 2 Craftsmanship didn't seem to matter much before I did any 1 star item, especially if I use Baked Onion Soup. *Updated 25 Aug 2015: I finished melding the ring to gain +2 Craftsmanship. DO NOT follow how i melded these earrings!!! This was a silly way to do it! This way you dont have to overmeld a tier IV on the 4th meld, which saves a lot of money! These were done correctly. So you can follow my melds here. But again, please check the prices of materia on your server and start from the most expensive. The chest piece has a lot of Craftsmanship that you can fill. So I decided to go ZERO control here. *Update on 25 Aug 2015: I added 5 more Craftsmanship on the last meld (right panel). Upper Panel: As you can see, for my hat, gloves, pants & shoes, I have left much room for more melds later. *Update on 25 Aug 2015: I added 3 more Control per gear on the 4th meld. And then after that, I added either another 3 control, 2 craftsmanship or nothing. 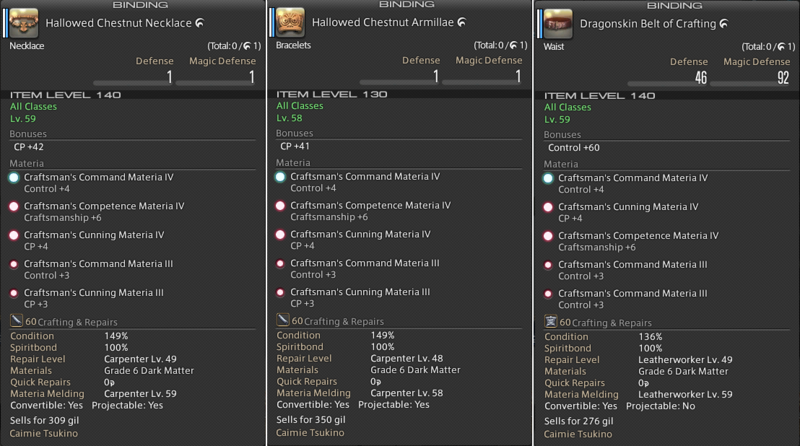 Because of the requirement of Tier V materia to max-meld the chest, mainhand and offhand, I have decided NOT to bother with overmelding them, but only to add 4 CP to each of the mainhands and offhands (see below). 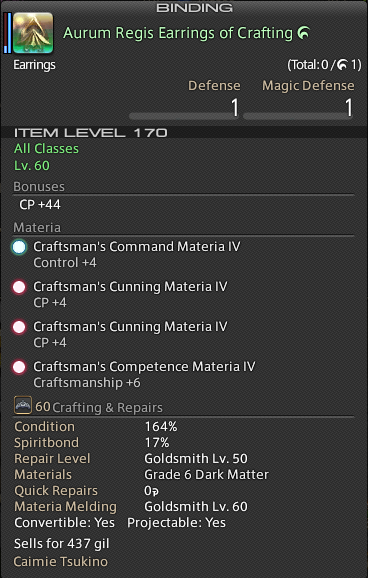 As of 24/11/15, I have also temporarily melded 18 craftsmanship onto the chest using cheap materia (Competence III, III, III, I) to help me go over the threshold of 845 craftsmanship. Because 845 craftsmanship allows me to use my super rotation for 1 Star 35 durab Specialist Recipe (See Ch50 below). 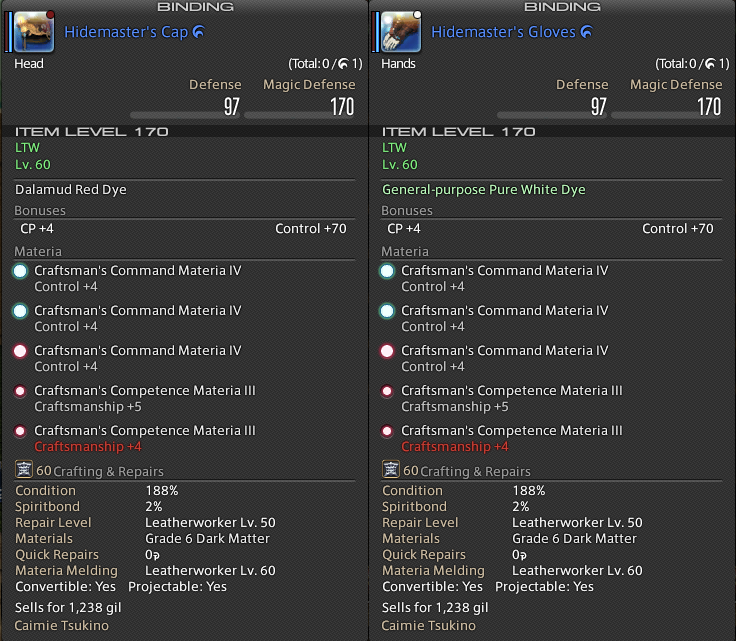 I believe it'd be wiser to wipe these temporary melds, and then properly overmeld them after we have more access to Tier V materia in the future. I have always been a big CP person. More CP allows more flexible rotations on macros, less Hasty Touches, and sometimes better chances to save a dire situation with a lot of Hasty fails. So I crafted the HQ i170 accessories for myself early, and penta-melded early, before other i170 gear. - This Armillae cannot be maxed to meld cap with pure Tier IV materia. So I have left out a bit of Craftsmanship. I have maxed both CP & Control here. It provides 52 CP, 8 Control, and 5 Craft (Craft is not maxed here, max cap is at 9 Craft). The i130 Hallowed Chestnut Armillae HQ provides 49 CP, 7 Control, 6 Craft (not maxed). The 3 extra CP you can get from the i170 Armillae is of higher importance than Control or Craft. - The i170 Necklace has exactly the same melding cap as the Armillae. On this item, I have decided to leave room for the last meld. It also revealed to me that the max cap for Craftsmanship is actually 9. At this point, I can either meld 3 more Craftsmanship or 4 more Control. It really comes down to the need, so I think I'll leave the last meld open for now. Just like the i170 Armillae, this item provides 3 extra CP than the i140 Hallowed Chestnut Necklace. Clearly, CP is something to be maxed. Control vs Craft is your choice. - I have maxed the cap for this ring. It provides 27 CP, 8 Control, 9 Craft. The i110 Hallow Chestnut Ring HQ provides 24 CP, 6 Control, 7 Craft. The 3 extra CP you can get from the i170 ring is of higher importance than Control or Craft. - The CP here is maxed. There is still 4 more Control or 3 more Craft left, which I can add in the future. I overmelded it this way, so later I can choose to meld Command III or Competence II / III. These earrings provide 4 extra CP over the i120 Dragon Fang Earrings. - There's no point to pentameld our i170 mainhands and offhands yet. I have only added 4 CP onto my mainhand & offhand. Keep in mind that, when you try to craft your i170 mainhands & offhands, acquiring the offhand is actually more beneficial than acquiring the mainhand. This is because our initial end-game gear is i150 on mainhand and i140 on offhand. So the 30 ilvls on offhand makes the upgrade a bigger improvement than the 20 ilvls on mainhand. - The chest has A LOT of stats to max. It is impossible to max it using only Tier IV materia. Thus, I decided NOT to meld anything at all at the moment. 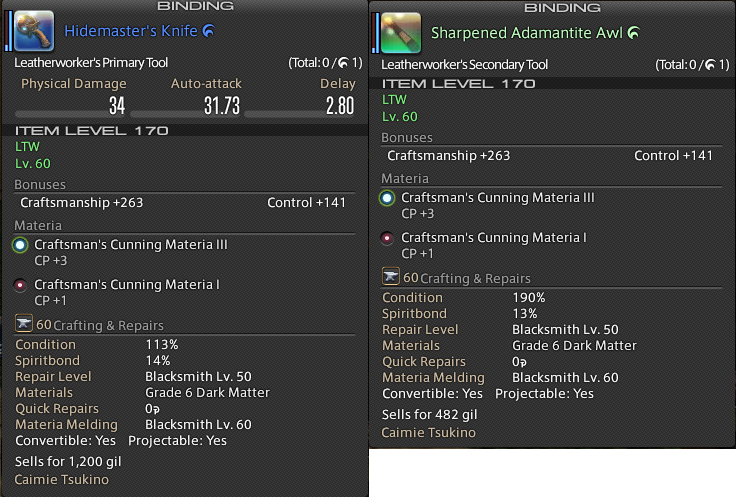 *Update 24/11/15: I have added 4 cheap materia onto the chest - Competence III, III, III, I. 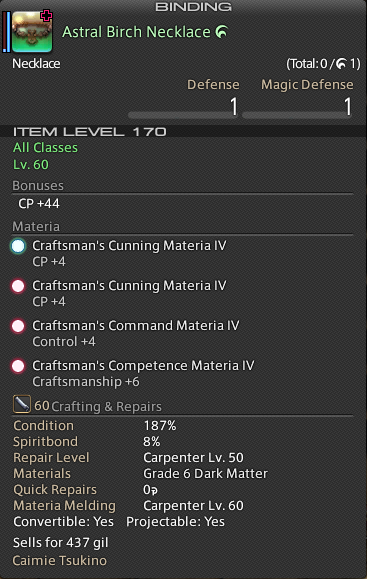 This is a temporarily meld that provides 18 more craftsmanship for me, and I may wipe it clean in the future to meld with Tier V materia in the future. 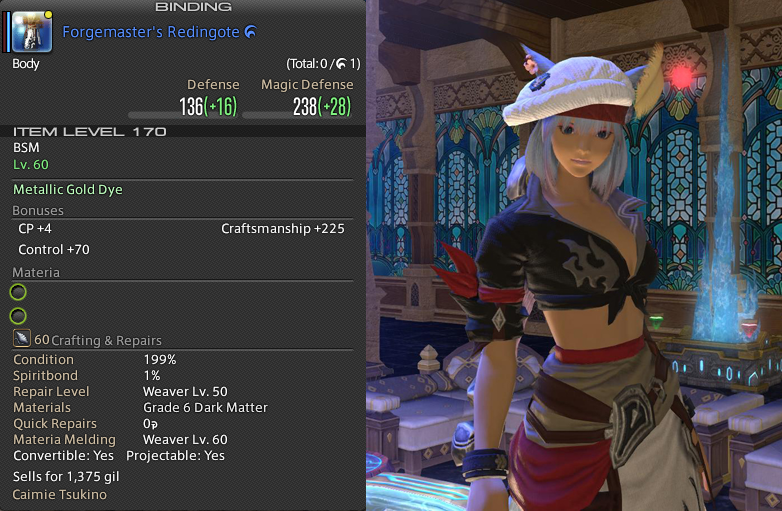 - I have maxed the melding-cap on these hat & gloves with only Tier III & IV materia. Please feel free to follow my way of melding. On the 3rd meld, if you prefer to overmeld with Command Materia III instead of IV, it's probably ok too. In the end, you will only lose 1 control from the hat and lose 1 control from the gloves. But you should try to max all 9 craftsmanship. *Notice on my server Competence III is cheaper than Competence II. So I used III instead. - I have maxed the cap on these pants & boots as well. Whether to start with the Cunning IV first or Command IV first depends on the price of those materia during the melds. 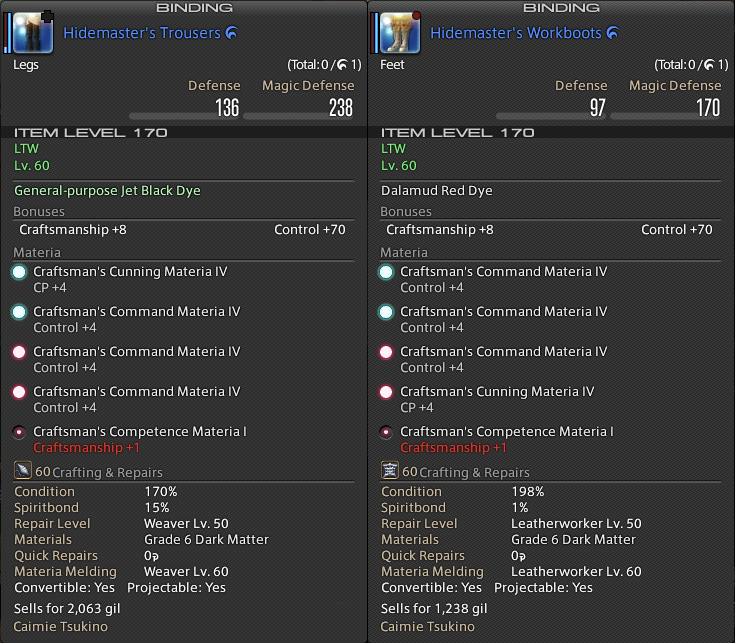 These items were tougher to max than the hat & gloves since they require Tier IV on the 4th meld. The most important thing is to max out CP!!! 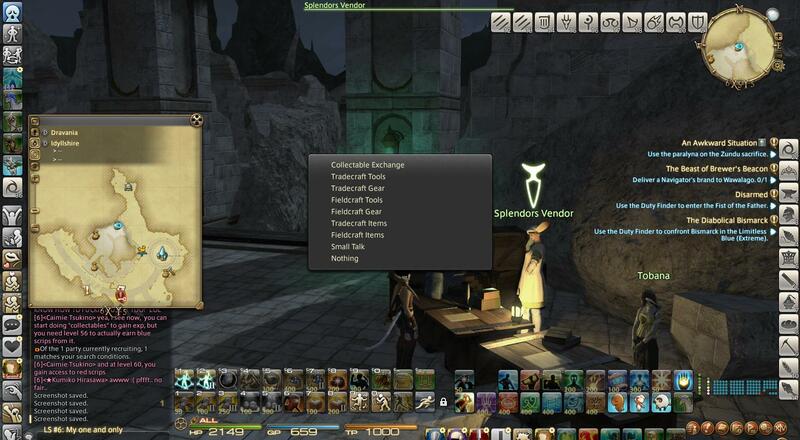 In HW, S-E has created "Specialization" for crafting classes. You can choose up to 3 classes for Specialization, and let those classes equip a "Soul of the Crafter". The class(es) will then gain access to some new Heavensward crafting skills. At level 55, you will be able to take a quest from Lydirlona at Mor Dhona. She will give you 3 Souls of the Crafter. In order to equip the Soul Crystal, you need to go and visit Alderan (The Pillars, 14, 10). 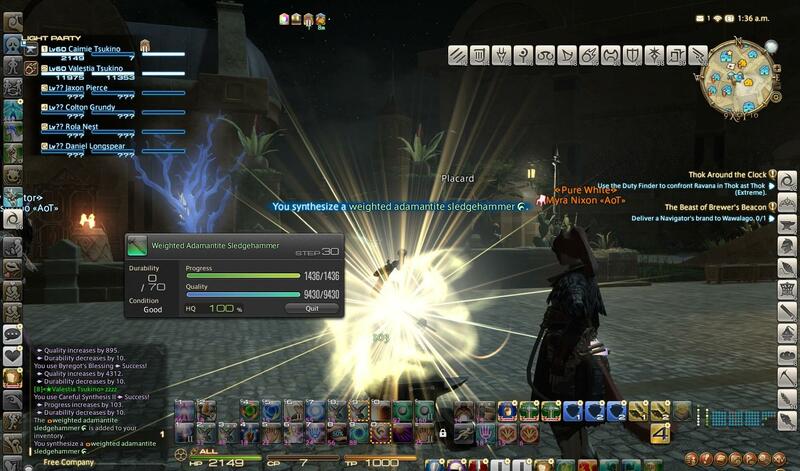 There, you will be able to select the class(es) that you want to equip the Soul Crystal(s) (see this thread for details: http://ffxivrealm.com/threads/how-the-heck-do-i-equip-that-soul-of-the-crafter.14615/). After that, just equip the Soul Crystal like any DoW/DoM jobs. Before Patch 3.1, specialization is NOT needed for anything yet, so most of us have only selected 1 class, and saved the other 2 Souls for later use. Once your choice is made, it is very difficult to change. In order to change, you need to buy a new Soul of the Crafter using 480 Red Scrips. That's more than 1 week's work. So it's a big switching cost. - Alderan (the NPC to let you choose your specialization and equip your "Soul of the Crafter"). 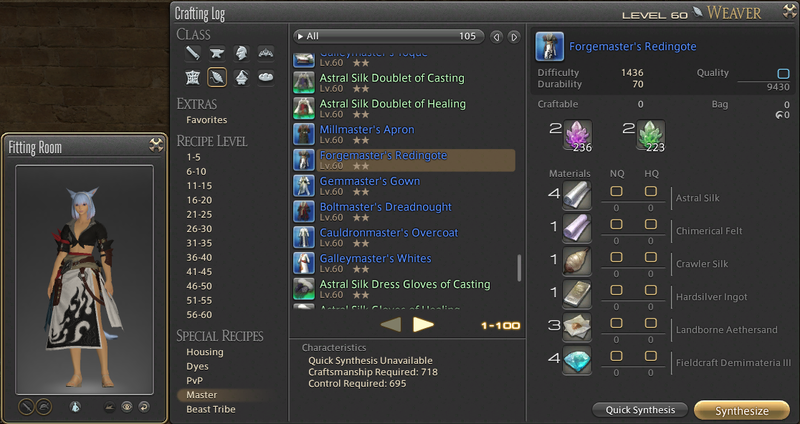 After Patch 3.1, specialization is needed to craft "Specialist Recipes", including the ingots/ cloths/ leathers for the making of i185 Sky Pirate's gear (battle gear). ARM / LTW / WVR / GSM all make some i185 gear, while BSM makes only ingots, which GATES the making of all ARM items and some GSM items. Nevertheless, "Specialist Crafting Skills" (see next chapter) are still not needed to make any of these items. 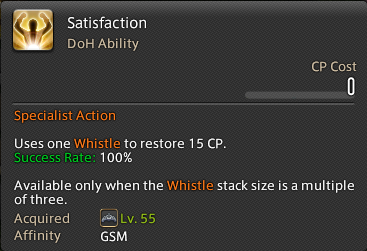 Heavensward crafting introduced the new "Whistle System", which is an addition to our existing Inner Quiet system. 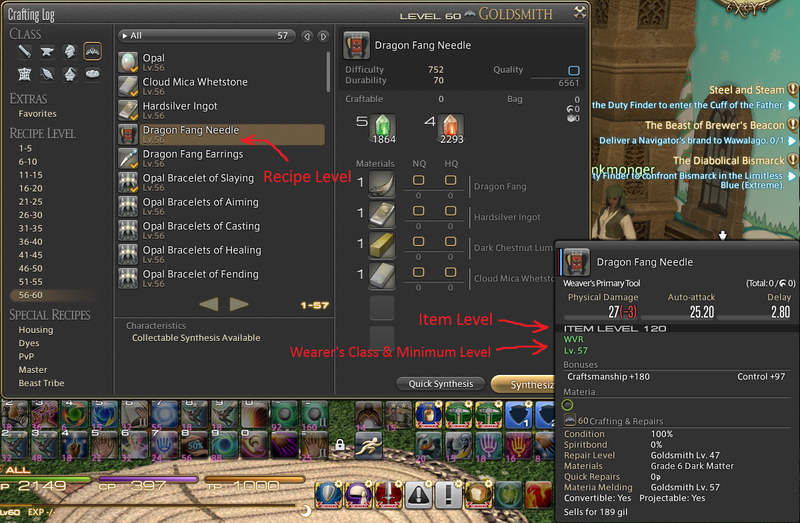 At the moment, this system is NOT necessary yet for the current Master Recipe III items. However, we expect the mastering of this system is required to craft very difficult items that are to come in the future new patches. So it's good to learn your whistles right now. *All these skills require you to equip your "Soul of the Crafter" to use. There are other specialization skills too (like Innovative Touch & Byregot's Miracle). But the other skills can work OUTSIDE the Whistle system. Where as, the (a), (b), (c) above makes the most basic "package" of the Whistle sytem. Without them, your Whistle system won't have enough power to function well. Grants a Whistle stack of 11. One Whistle used for each step that material condition is Good or Excellent. Increases the effectiveness of certain crafting actions when the stack size is a multiple of three. Progress increases significantly when stack size reaches 0 and effect wears off. So far, Kylus and Kakera Kiseki have reported that synthesis (progress) gains an additional 50% efficiency when used at W stack 9/6/3. I have confirmed this myself (Careful Syn II, which normally gives 120% efficiency becomes 170% efficiency at W9/6/3). As for the efficiency of touches (quality), it is UNAFFECTED by W stack 9/6/3. When the W stack reaches 0, a special action called "Finishing Touches" will automatically occur (see pics below). This action will give 200% efficiency on progress, and consume 10 durability. To be frank, this gives more trouble than benefit! If you have not finished working on quality yet, it may prematurely completes your item. Since it's an automatic action, you can't even stop it. So we have to be very careful if our W stack is at 1. Whenever Whistle stack is 9, 6 or 3, you want to use Satisfaction to recover 15 CP. However, before you use Satisfaction, you have a choice of making use of the W stack 9/6/3 for pushing progress. If you decided to push progress, and if the condition turn doesn't change, you can then collect your Satisfaction afterwards. 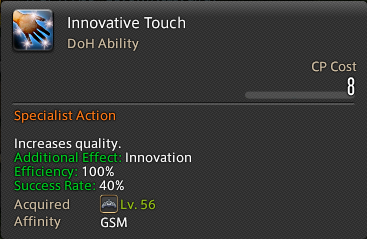 However, if a "Good" popped after you pressed a synthesis, both the Satisfaction & Trick of the Trade buttons will be available at the same time. You can then only choose 1. In this case, you should collect the 20 CP using Trick of the Trade, and give up the 15 CP of Satisfaction. Significantly increases both progress and quality. 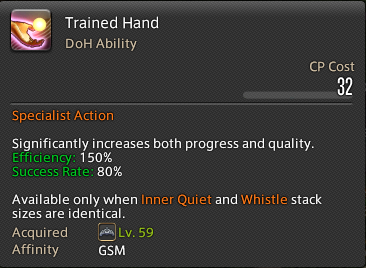 Trained Hand is one of the best skills in Heavensward crafting. Normally, it provides 150% efficiency for Progress & 150% efficiency for Quality. (1) Progress is affected by the W stack. When W stack is 9/6/3, you will get 50% additional efficiency for Progress (200% total). Quality is unaffected by the W stack. (2) Quality is affected by conditions and buffs. E.g. under "Good" or "Excellent" conditions, the 150% efficiency on quality is multiplied by 1.5 or 4 respectively. Quality is also affected by skills like Great Strides or Innovation. The biggest disadvantage of this skill is that you gotta be very careful how much progress it gives. If you had previously made use of the W stack 9/6 to push progress, Trained Hand may one shot and completed the item before you finish working on quality. So pay special attention when you use this skill. It is better to use it early before a lot of progress is done yet. 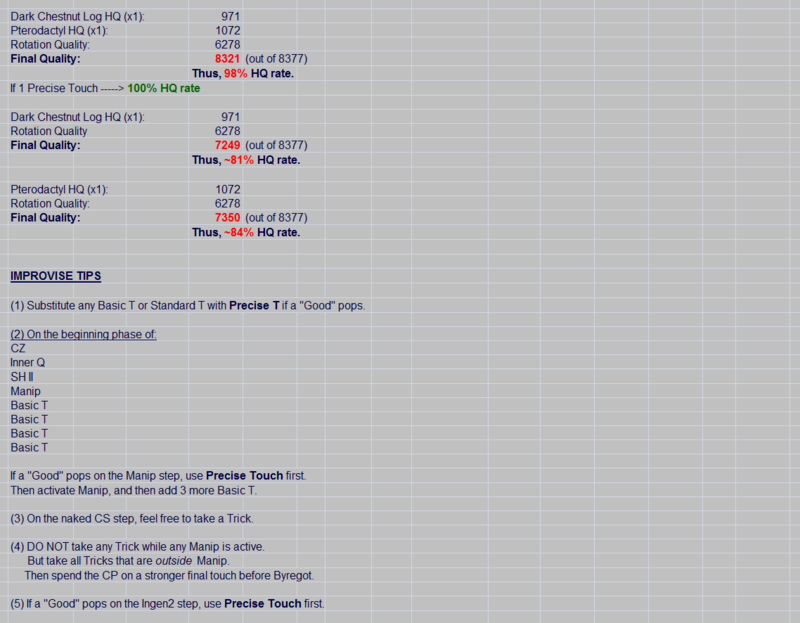 In conclusion, Trained Hand is a very powerful skill, and is totally worth your CP if you do it right. - The 2 pics shows how I used Trained Hand at Whistle Stack 6. Thus, progress increased by 200% efficiency and quality by 150% efficiency. After this, I was able to take Satisfaction for 15 CP. When durab is low, you can use Nymeia's Wheel to recover durab with the cost of your remaining Whistle stack. Interestingly, in contrast to most of our original predictions, this skill actually recovers MORE durab when the W stack is LOWER. It is by far the most CP efficient skill for durab recovery if you can get down to W stack of 3 or lower. However, getting down that W stack is a luck-dependent thing. So don't count on it. Hence, Master's Mend II is not going to be replaced. We will still need MM II for our first durab recovery for any 70 or 80 durab item. Costing only 8 CP, Innovative Touch is essentially a Hasty Touch with with even less success rate, but grants 3 steps of Innovation effect if successful. The problem is the low fidelity. So far, it has a big tendency to fail when we need that Innovation effect... and it BACKFIRES at you, as you will lose a touch when it fails without leaving you any Innovation effect afterwards. To be frank, I'd rather save up 10 extra CP to spend 18 CP on a proper Innovation. This skill is only good when you really need that extra power, and is really wishing to gamble for it. Every 10 Delineation cost 250 Blue Scrips. So each Delineation = 25 Blue Scrips. It's not a lot, but is still a chunk of time & money. The real problem is not the scrips, but the 45 CP which you invested for 7 steps of "higher chance of Good". It's a big chunk of your precious CP, and yet since Good condition does not come in 2 steps in a row. You will probably get about 2 to 3 goods in those 7 steps. Is that worth 45 CP? I don't know. The true function of this skill is yet to be revealed. The "Additional Effect" of increasing IQ by 1 is on top of the IQ increase of a regular touch. Thus, Precise Touch gives 2 IQ stacks. 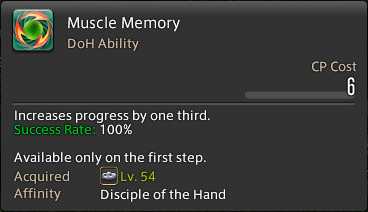 Face the fact, this is probably the best new skill in Heavensward. It's the most reliable skill, and its effect is gigantic. Back in ARR, I have already proposed that it's NOT always the best choice to take Trick of Trade. Sometimes, a Basic Touch at Good condition is actually better since it gives 150% efficiency (Please see Part 1 of this guide, Crafting Condition chapter). Now? with PT, S-E has made it even clearer to us that we really should try to make a choice between Trick or touch. Theory 1: You should take Precise Touch as early as you can, so that your Hasty Touches afterwards will be stronger because of the higher IQ stack and higher bonus control. Theory 2: You should not take Precise Touch early, but take Trick of Trade first, so that you know you will have more CP for later. It's debatable. I personally like to take a Trick of Trade on my first "Good". For the 2nd Good, I may still take a Trick or I may use Precise Touch. On the 3rd Good, I definitely will use Precise Touch. So I guess I tend to favor Theory 2 a bit more. But it really comes down to the circumstances. Completes 1/3 of remaining progress in 1 step at 100% success rate. This skill is golden (especially in macros). It's the new Piece by Piece, but better... in the sense that it's 100% success rate and cost only 6 CP (PBP is 15 CP at 90% success rate). The only disadvantage of this skill is that you can only use it ONCE, on the 1st step. "Reduces Flawless Synthesis CP cost and durability loss to 0. Effect duration determined by current progress. Available only on the first step." (2) FREE progress using multiple Flawless Syn! Basically nothing is consumed. No CP loss, no durab loss (except the 20 CP for Maker's Mark, and you can recover most of that from Comfort Zone anyway). Each Flawless Syn gives only 40 progress. But it can add up to quite a bit given enough steps. (1) Fidelity issue & completion steps calculation issue. The annoying thing about Maker's Mark + Flawless Syn is that Flawless Syn has only 90% success rate. And if you wanna add in that Steady Hand, that's an extra 22 CP to spend, and you lose 1 step of Maker's Mark. I do NOT recommend doing so, and suggest to just gamble on that 90% success rate. But this also creates a second potential issue - the amount of progress it gives is actually difficult to be predicted. You could get 240 progress for one item, but you could get 160 for the same item next time, which make the calculation of completion steps a pain. (2) MaMa & MuMe are MUTUALLY EXCLUSIVE. Both skills can only be activated on 1st step. Thus, if you use Maker's Mark, you can't use Muscle Memory. Also, Muscle Memory is only 1 shot at 100%; where as Maker's Mark + Flawless Syn is many shots at 90%. The more difficult the item is, the longer the duration is, and the more chances you may fail some Flawless Syn. (3) Maker's Mark + Flawless Syn do consume 2 Cross Class Skills slots. This could be a problem sometimes. (4) IT IS FREAKING SLOW - when your difficulty is 3000 or above, it will give you over 30 steps of free Flawless Syn, and it takes FOREVER to craft that item! So yeah, although you bought yourself a lot of room with that 30 steps for CP recovery and free progress, it takes a big chunk of patience (in real life) to do it... Comparing with MuMe, although MuMe is weaker, MuMe only takes 1 step - BAM - and it's already finished. 201 difficulty will give 3 stacks, etc. If no other skills are used, and if all Flawless Synthesis landed successfully, it will add up to ~40% of the total progress, at the cost of 20 CP and no durability loss. For HW 1 star items, we get 12 steps of MaMa. For HW 2 star items, we get 15 steps of MaMa. Since both 1 & 2 star items have more than 10 steps of MaMa, if you just activate Comfort Zone (CZ) on your 2nd step (after MaMa is activated), you will get back 14 CP by the time you finish all steps of MaMa. 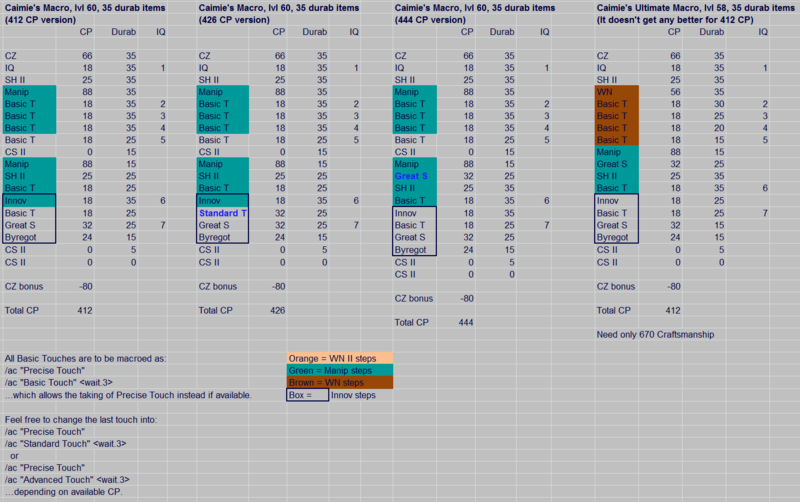 Thus, in the end, you would only have spent 6 CP - exactly the same amount as MuMe. Yet, your progress may be even MORE than MuMe. Furthermore, unlike MuMe which consumes 10 durab, you would not have consumed any durab at all if you used MaMa+FS. Thus, for 1 & 2 star items, it is for sure that MaMa is BETTER than MuMe! However, it does consume 1 extra Cross Class Slot, which sometimes can be a problem. Given sufficient Cross Class Slots, ALWAYS use MaMa instead of MuMe for 1 & 2 star items! Notice that if you activate CZ on your 2nd step, and if you try to take a Trick of Trade during MaMa, your CP will hit over max, and you will fail to gain CP. The clever Katlyna (Katrisa Ashe) has developed a simple method to solve this. After using MaMa, CZ, then follow up with Inner Quiet. This will immediately consume 18 CP (which is necessary for your rotation later anyway). This way, you can then afford to take in 1 Trick. However, notice how CZ, IQ and Trick all consume a step of MaMa each. Thus, you will lose 3 steps of MaMa with this strategy. Since we usually don't waste 22 CP and 1 step of MaMa on Steady Hand, we must expect at least 2 to 3 Flawless Syn (FS) to fail during MaMa. Thus, if you do this for a 1 star item, 12 - 3 = 9... 2 more failed FS... = 7. You will likely only have 7 successful FS left, which means your progress will only be 7 x 40 = 280. This is significantly less than MuMe, which would have given 360 progress. Yet, you may have more CP and your durab would not have decreased at all if you used MaMa+FS instead of MuMe. Also, keep in mind it is important that you DO NOT use any "touches" for quality durab the string of Flawless Syn when MaMa is active (not even if an Excellent shows up). Otherwise, you further waste your MaMa steps. Increases progress by 40 at 90% success rate (cost 15 CP if not paired with Maker's Mark). Old skill from "A Realm Reborn". Used to be totally useless. Now becomes very useful for HW 1 star & 2 star crafting. For the next 5 steps, Brand of [Element] efficiency is increased. Increase determined by current progress. Only one Name of [Element] action can be used per synthesis. The tool tips failed to explain how strong this can actually be beyond its use on Elementally Aspected items. For most of the 35 durab items (non-elemental, including recipe lvl 58 Adamantite Nugget & lvl 59 Scale Glue), the pairing of these two skills would actually let you 1-shot the item. For Scale Glue, that usually requires 3x CS II for completion, the 21 CP spend on 1-shotting it maybe worthwhile. For 70 durab items (non-elemental, like recipe lvl 58 Marron Glaze), Name+Brand of Water. will let you reach over 50% progress with 1 shot, which is also extremely nice. It is more effective than Ingen1 or Ingen2 in some cases. However, since its efficiency is based on (1) your craftsmanship, (2) remaining progress, and (3) recipe level, it's very difficult to predict how much progress it gives until you tested it. So far, I actually do not favor the use of it for Heavensward 1 star items. For 1 star items, Name+Brand seem to not do enough progress for the CP invested (see data in the last chapter below). I prefer to use Muscle Memory + Rapid Syn combo if craftsmanship is above 728, since RS is CP-free. As for lvl 58 items, Name+Brand is certainly effective in 1-shotting the items. However, I have already developed macros for them that relies on CS II, and the macro can be used for every class... Thus, the use of Name+Brand will only create inconvenience for me when I use macros, because not every class will have the same Name+Brand. Byregot's Brow is a Basic Crafting Skill acquired at level 51. 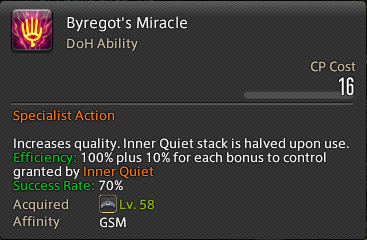 Byregot's Miracle is a Specialist Crafting Skill acquired at level 58. 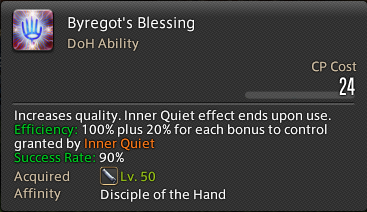 Byregot's Blessing is an old school Cross Class Skill acquired at level 50 Carpenter. Byregot's Brow is a "mini Byregot" that can only be activated during "Good" or "Excellent" conditions. It has a base efficiency of 150%, so it's HIGHER than Byregot's Blessing's base efficiency. However, each IQ stack only give rise to an extra 10% power increase, where as Blessing has 20%. Thus, Brow is STRONGER than Blessing when IQ stack is lower than 6, but Blessing is STRONGER when IQ is higher than 6. Supposedly, Brow is a good skill to be used if you're making an item that does not need more than IQ6. Sadly, since you have no control over when a Good will pop, you cannot plan this skill! Also, this skill has only 70% success rate, so SH II must be active to ensure its success. What's the chance of making an item that needs only IQ5, and having a "Good" condition right after you click Steady Hand II & Great Strides? Pretty slim, huh? So that just makes this skill relatively useless. As of Patch 4.05, Brow no longer require "Good" or "Excellent" condition to be used. Also, its success rate is increased to 100% if the the user is a Specialist. Thus, it is a valid substitution for Byregot's Blessing when IQ is lower than 6 (for Specialists). It is still a viable substitution for Blessing when IQ is higher than 6, but it is expected to be much weaker than Blessing. Byregot's Miracle is another "mini Byregot". The good thing about this skill is that it only consumes half the IQ stack. If the IQ stack is odd number, it will retain 1 extra IQ stack over half. (i.e. IQ5 will be cut down to IQ3). I have proposed that this skill may be useful if we have a very difficult item that even IQ11 cannot HQ. In such a case, we may push IQ to 5 or 7, then use Great Strides + Byregot's Miracle to consume half the IQ stack for a powerful quality move. Then gain back that lost IQ stack quickly via Precise Touches, and use Byregot's Blessing as a final blow at IQ10 or 11. However, currently, I do not know an item that can utilize this hypothetical rotation yet. So the power of this skill is yet to be revealed. 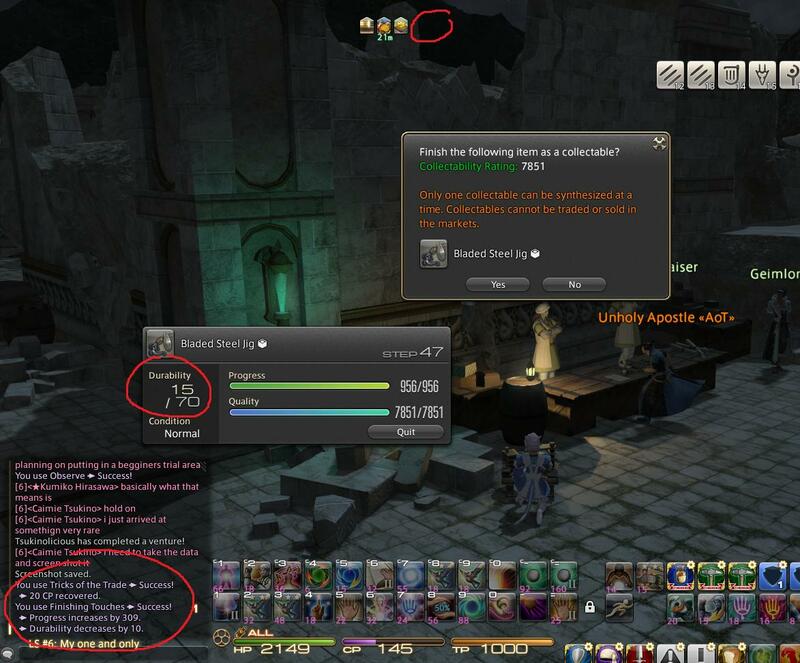 UPDATE: As of Patch 4.1, Byregot's Miracle is finally useful for Special 2 star recipes in Stormblood! 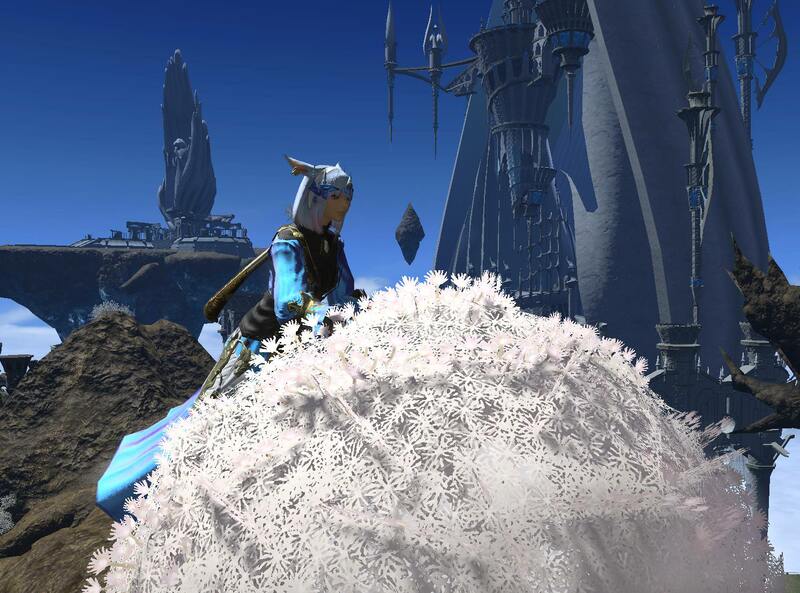 Please see Ch60 in Caimie's Stormblood Crafting Guide. Still the ultimate "Kamehameha" of the crafting game, this skill is indispensable. 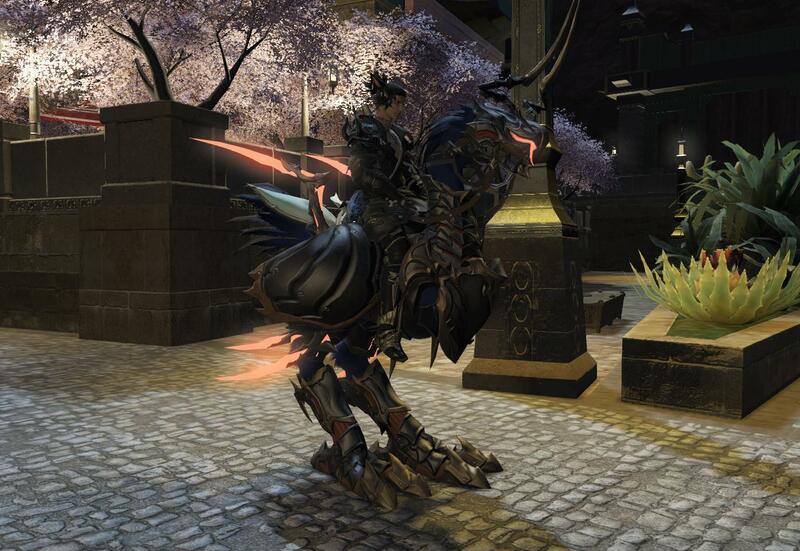 None of the new Heavensward mini Byregots can replace it. So, on that sense, S-E's claim that single class crafter may prevail in HW is somewhat inaccurate... Without a proper Blessing from lvl 50 Carpenter, how the heck can someone craft the difficult items with just the mini Byregots? I guess what S-E meant, was that you don't need to have every class at lvl 60 to play HW end-game (since there's not many cross class skills in HW anyway), but you will still need most of your classes at least level 50. (ii) stronger synthesis actions at W stack of 9/6/3. The CP recovery only happens when you manage to get all 3 Satisfactions (which you get a net gain of 9 CP). If you can't get enough "Good" conditions to lower the W stack to 3, you actually LOSE CP. 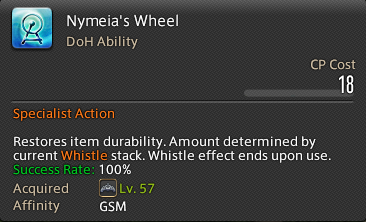 I recommend NOT to use the Whistle at all if you don't have Trained Hand & Nymeia's Wheel. 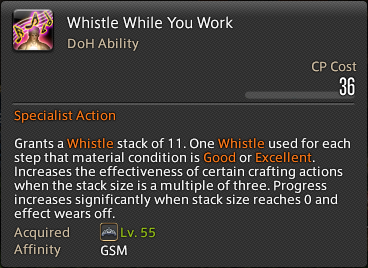 You should NOT use Whistle either if the synthesis process is too short for you to get down to W stack of 3. For a 35 or 40 durab item under level 59 recipes, if you are not making enough progress with your synthesis, it's better to use Ingen2 to buff your Careful Syn II, or just use Rapid Syn instead, which is free. Don't bother with Whistle While You Work. (i) & (ii) are NOT mutually exclusive. However, if you click Satisfaction first, your W stack will drop, and you won't be able to use (ii) anymore. In contrast, if you push a synthesis button first, you may still use Satisfaction afterwards if the condition does not change. If a "Good" or "Excellent" pops, then you miss your chance of using Satisfaction, but you can take 20 CP from Trick of Trade instead. If the condition doesn't change, you can actually keep pushing Careful Synthesis II, and you will keep getting 170% efficiency. Personally, I either don't push Careful Syn II at all, or even if I do, I will only do it once, and then I'll usually take that Satisfaction before it goes away. (2) NW allows you to recover 10 to 30 durab at the cost of 18 CP... hopefully 30 durab when the W stack reaches 2. You wanna use NW at W stack 2, because you wanna grab that last Satisfaction at W3, and that leaves you W2 which doesn't have any other functions... If W goes to zero, the automatic action "Finishing Touches" is rather dangerous. So I suggest forget that, and just grab your 30 durab with NW if you have that 18 CP. Unfortunately, (2) is luck-dependent since you may or may not get as much as 30 durab recovery if your W stack is not low enough. Thus, Trained Hand is actually the main hero here. You will get it, because your IQ stack is constantly increasing. Whether it's at stack of 6 or stack of 9, it will likely run into a moment which the IQ stack and W stack are the same. And when it comes, prioritize TH over Satisfaction or Trick of the Trade (if you use Satisfaction or Trick of the Trade, TH will NOT be available anymore). TH is currently one of the biggest function of the W stack. This brings us to another topic about Precise Touch. We all love Precise Touch. But imagine if your IQ is at 6 and W stack at 7. Then a Good condition comes, and you used Precise Touch. Your IQ will jump to 8, while your W will drop to 6. You will then miss your Trained Hand, and this could be a big nightmare. My advice? Keep a good eye on those stacks and be careful when you use Precise Touch. In a case like this, one should probably take a Trick instead, and let the W stack fall to 6. Then with the extra CP, use Trained Hand while both IQ & W stacks are at 6. Progress will increase by 170% while quality will increase by 150%, which is well-worth your 32 16 CP. However, if the condition was "Excellent" instead of just "Good", you may consider skipping Trained Hand entirely, and just Precise Touch it. The Whistle system is best to be used together with Maker's Mark + Flawless Syn, which adds many extra steps for the W stack to fall. This system is only good for items with very high difficulty, which generates many steps of Maker's Mark, allowing the W stack to fall down earlier. This will lead to CP recovery and the Whistle system to actually function at 9/6/3. This will in turn give you even more extra CP, and advantages of pushing extra progress at 9/6/3. The Whistle and the CP will then allow Trained Hand to function properly. And in the end, you may even use Nymeia's Wheel to recover even more durability. In contrast, if you are dealing with a low difficulty item, the Whistle system will actually hurt you. Currently, most of us have picked 1 class for specialization, but we are saving our other Soul Crystals to decide on our other specialized classes later. I saw a few threads on Reddit. It looks like a lot of people are having trouble with the 35 durab items. And even those who claimed to be doing fine apparently have been promoting the use of WN, which I was shocked. So I constructed the following figures. Hope it helps. - Forgot to add: if "Excellent" condition pops any time under active SH II, just Precise Touch it. Even if durab is at 15 when it pops (like the example #2 above), Precise Touch it anyway, let durab fall to 5, then Manip, and then use SH II (even if the previous SH II hasn't ended yet), and let durab float back to 15, before you Hasty Touch again. - If "Excellent" pops when SH II is not active, then just take a Trick. The reason to develop these macros is to have the ability to massively produce leathers and ingots for sale or for crafting final products. My macros make use of ZERO Hasty Touches, so they took away the risk factor. You will always get a good minimum amount of quality from it. There will not be any failure steps. If the percent HQ rate is too low in the end, you will need to either obtain stronger control stats, CP stats to generate a stronger rotation, or simply use a bit more HQ raw mats. Keep in mind that macro is great and efficient, but it requires a lot of stats (especially CP) and it's inflexible in improvising. Manual crafting will always produce much better results. NQ: 10% Craftsmanship, 49 max. 4% CP, 14 max. HQ: 12% Craftsmanship, 61 max. 5% CP, 18 max. This food adds even more craftsmanship than Rolanberry Cheesecake, and it adds CP as well. It is a ARR 3 star item (from the original "Master Recipe"), and the ingredients (the Megalodon) are extravagant. But NQ Shark Fin Soup are not too expensive on the market. 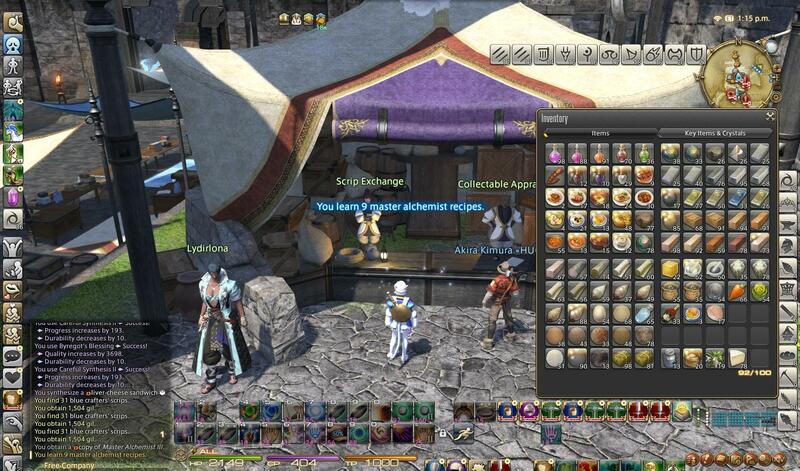 The old NQ Stone Soup sold at 37 gil each by the NPC at Gold Saucer is still a very awesome food for general purposes. I always have a whole stack in hand, and I pop 'em at will for my daily crafting. 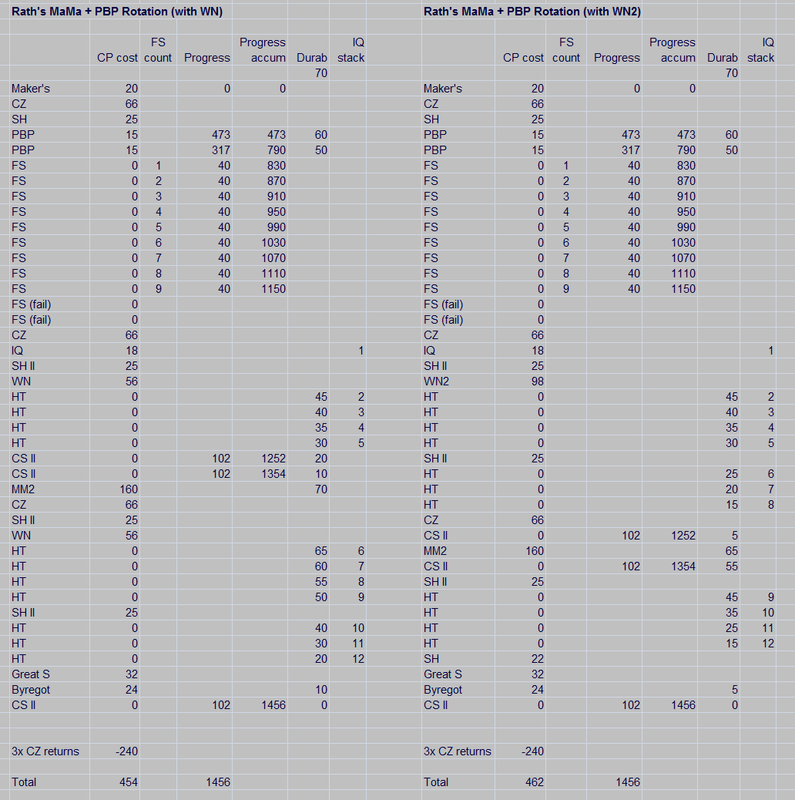 Most of my HW end-game macros & rotations were constructed to utilize a total CP of 412. Thus, a base CP value of 395 plus the use of Stone Soup (+17 = 412) will be sufficient for most situations. The classic end-game food from ARR is still quite useful and strong in HW. It is now relatively cheaper, but is still a luxury comparing to Stone Soup. Baked Onion Soup is basically an upgraded version of the Bouillabaisse from ARR. Apart from more CP, it also adds craftsmanship, which can be very important for many situations where you may be lacking a slight bit of progress to complete your items. Emerald Soup is currently the strongest craftsmanship food in the game. "Bullion Cube" (a Blue Scrip mat) is required to craft this, and so this is not a cheap item. Clam Chowder is currently the strongest control food in the game. Seafood Stew is a new CUL Master Recipe III item. It is currently the strongest CP food in the game. At 763 craftsmanship, one can afford 2 failed Flawless Syn. At 783 craftsmanship, one can afford 3 failed Flawless Syn. At 811 craftsmanship, one can afford 4 failed Flawless Syn. *Take away Innovation to save 18CP if necessary. So, despite the use of Hasty, it's very secure with quality. You can easily afford 4 failed Hasty and still do fine. The following is a newer version of my 1 star macro, which my craftsmanship has reached over 900. Muscle Memory gives 368 progress, so as long as each of the CS II under (ingen2) gives at least 187 progress, then it's fine to use. What's good about this macro is that it is super FAST! Only 30 steps are needed, which fitted perfectly into 2 macros. Plus the use of Innov + Ingen2 to boost quality, plus a "Byregot's Brow" baiting to avoid Excellent condition falling onto Ingenuity II (which will lead to the Poor landing on Byregot's Blessing). But since Byregot's Brow has only a 70% chance of success, so we have to use Steady Hand II on the finisher phase, which leads to 3 more CP being used. - I did my first 1 star with as low as Craftsmanship 682, Control 650, but it was a bit too dangerous. I recommend at least 728 Craftsmanship to handle it. - It is extremely difficult to acquire the mats for i170 2 star gear. Please visit my Heavensward Gathering Guide. See "Ch11: Ephemeral Nodes & Aetherial Reduction" & "Ch12: The Nightmare of Favors" for details of how to play the gathering game of Folklore Legendary Nodes, Ephemeral Nodes and Concealed Nodes (Favors) to get the mats. Concerning my personal nightmare experience with Favors, it be found on this thread. *unprotected Flawless Syns can afford failing 2 times. I personally favor Method (3). Despite it looking complicated, and despite using 2x PBP that cost 30 CP, it's actually the most secure of all, and most CP efficient of all. The number of completion steps is also just 5 (because Maker's Mark + Flawless Syn does not consume durab), so it's exactly the same as Method (2). In fact, Method (2) has a pretty big chance of failing 1 Rapid Syn, it probably needed 6 steps. So that makes Method (3) even more superior. Maker's Mark gives 15 steps of Free Flawless Syn for a 2 star item. 1 step used for Steady Hand, 2 steps used for PBP, you still have 12 steps left. Out of the 12 steps, you need 9 successful Flawless Syn. 3 of the 12 steps will be covered by the Steady Hand. So you just need 6 successful Flawless Syn out of 9 steps. Assuming you take 1 Trick of Trade or use Comfort Zone somewhere, you have 8 steps left. Among the remaining 8 steps of Maker's Mark, you can afford to fail 2 Flawless Syn, and still be totally fine. If you have bad luck and failed 3 out of 8. You will need to sacrifice 1 touch, and use 1 extra CS II. If you failed 4 out of 8. Your extra CS II will still cover it. So it's no difference from failing 3 out of 8. Alternatively, if you failed 2 Flawless Syn very early and you're very scared, you can pop an extra Steady Hand to cover the remaining Flawless Syn. But in doing so, you sacrifice you chance to take a Trick of Trade, and instead of gaining CP, you now have to spend an extra 22 CP. So I do not recommend this. I'd rather sacrifice 1 touch to do an extra CS II. The 3x CS II in Method (3) are also very flexible. You can fit them anywhere in your rotation while you're working on quality. For a rotation like this, just keep in mind to activate Inner Quiet after all Maker's Mark steps are finished. It's very, very common for people to forget the Inner Quiet button after struggling with Maker's Mark. For Method (3), the optimal Craftsmanship level is 776, as this amount gives 109 progress per CS II. Thus, it reduces the need of one Flawless Syn. 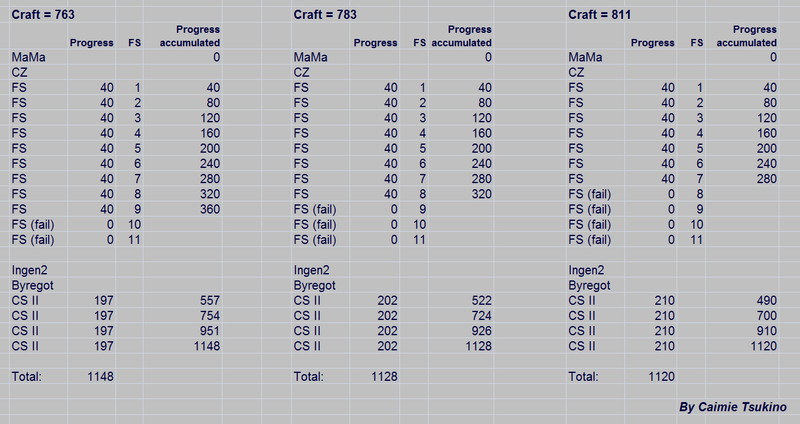 You will only need 1110 progress from MaMa+FS, and can still complete the item with 3x CS II after the FS's. This means, you can safely take 1 Trick of Trade during your string of FS's, and can still afford 2 FS failures. Another optimal Craftsmanship amount is 860, as this amount gives 122 progress per CS II. Thus, it further reduces the need of another Flawless Syn. You will only need 1070 progress from MaMa+FS, and can still complete the item with 3x CS II. This means, you can safely take 2 Trick of Trade during your string of FS's, and can still afford 2 FS failures. It is difficult to achieve 860 craftsmanship with the use of Seafood Stew HQ. But with the help of Baked Onion Soup HQ (which adds 28 craft), one just needs 832 craftsmanship. 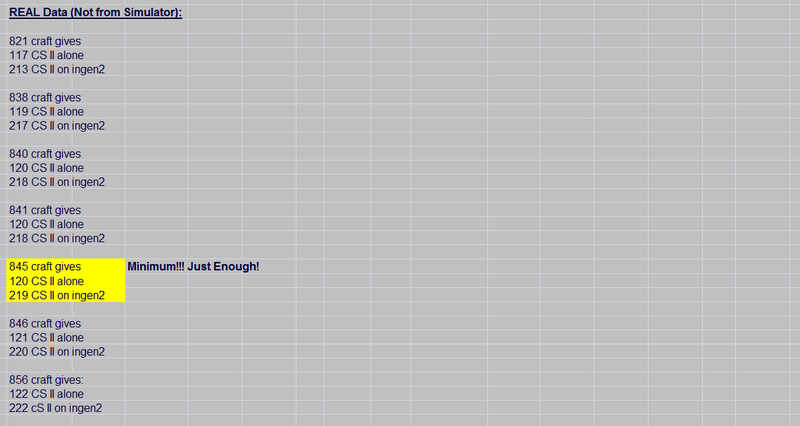 This amount is achievable as long as you have nearly all HQ i170 gear, and it does NOT require max melds on everything. Personally, I favor Rath's PBP + MaMa rotation Method (3) a lot, especially when that rotation only require the minimum 718 Craftsmanship. In all other classes other than BSM, Rath's rotation allows you to take either Innovation or Reclaim with you. For crafting of mats, I will load up Innovation, to further increase my HQ rate. For crafting of final products, I will load up Reclaim, just so that if 6 Hasties fail in a row (it can happen if you craft enough), you have a chance to Reclaim it back. However, BSM in particular does not have enough Cross Class slots to utilize that rotation while maintaining Innovation or Reclaim. This is because Rath's rotation does not utilize any BSM cross class skills. Thus, if you use Rath's rotation on BSM to craft a final product, then you will not have Reclaim at your disposal, which I personally feel rather risky. I have previously been using the Method (2) above for BSM. It works, but it is still quite risky. Especially if you fail 2 or 3x RS, then you're in grave danger of having to waste CP on redo-ing the Ingen2. Therefore, I developed Method (4) (see full rotation breakdown below). The disadvantage of it is that it requires 7 steps for completion. Thus, 2 more steps than Method (2) & Method (3), meaning fewer touches in the end, and a lower IQ stack. However, it's 100% risk-free. You will not have to worry about the danger of having to redo Ingen2 for some extra Rapid Syn in Method (2), which will cost you a lot more CP. It also requires 734 Craftsmanship. The advantages of it though, is that you can keep BOTH Innovation & Reclaim, which is extremely helpful. The addition of Innovation there is almost equal to an extra guaranteed touch. This rotation also cost very few CP for completion: Rath's rotation needs MaMa (20 CP), SH (22 CP) and PBPx2 (15 CP) = 72 CP, with CZx2, which the first CZ recovers 14 CP, and may have a chance for Trick of Trade during the string of FS's (Hence 72 - 14 = 58 CP, and potentially 38 CP if a Trick is taken). My Method (4) requires only 6 CP on MusMem and 32 CP on Ingen2 = 38 CP, but has no chance of Trick of Trade (Hence 38 CP only, without the need of Trick). Thus, you can see that minimum CP requirement for Method (4) is even lower than that of Method (3). In fact, if you are willing to spend some time modifying it, you can even take out either Innovation or Reclaim, then you can substitute MusMem with MaMa and Flawless Syn. In the end, you will get back the MaMa advantage of being able to take a Trick of Trade, and also have 10 extra durab for touches. You just need to measure and calculate the amount of progress you get from your CS II under Ingen2, and match them up with the progress you can get from MaMa+FS. When you have reached 818 craftsmanship, the 5th CS II under Ingen2 in this rotation would actually prematurely complete the item. So is this a bad rotation that cannot be used for stronger stats? Hell no! Rotations are highly flexible! There are more than one solution to this. Solution 1: You can easily adjust by delaying your Ingen2 by 1 step, i.e. use a naked CS II first, and then activate Ingen2, and then do 4x CS II under Ingen2 (See below). Solution 2: Even better, now you can allow 1x Trick of Trade during the 5 steps of Ingen2! How cool is that! But in order to be safe, you should plan to activate Inner Quiet later! If no "good" appears, and no Tricks could be taken, then use Inner Quiet to consume the 5th step of Ingen2. You can then resume to your 5th CS II (See below). You see? Think! And the solutions are all here! Now instead of having a problem, it actually became an advantage - flexibility in gaining more CP! Both Katlyna and Jade are extraordinary crafters that have been actively developing better 2 star rotations. You can pick up some very neat 2 star rotations from the above 2 threads! - BSM doesn't have enough Cross Class Skill slots to accommodate Completion Method (3) while maintaining "Reclaim". Method (3) requires Maker's Mark, Flawless Syn & Piece by Piece. Method (2) requires Muscle Memory, Rapid Syn & Ingenuity II. Innovation was abandoned in both classes here to fit in Reclaim. - Alternatively, Method (4) is also great for BSM, which allows Innovation to be kept because it does not need Rapid Syn. - Prove of principle that Method (4) works fine. - The crafting of 2 star items wasn't difficult at all. It was the gathering of mats that was hell. (i) HQ i170 is slightly weaker than i180 before overmelds. 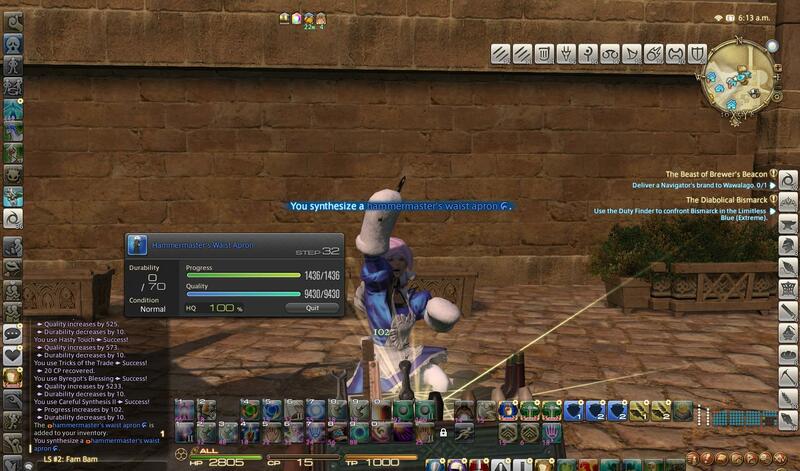 But i170 is stronger after penta-melding. 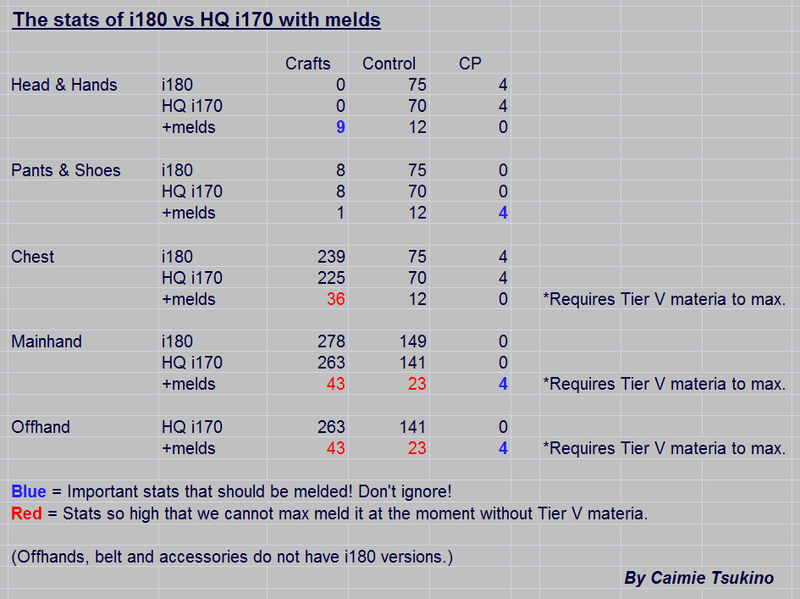 (ii) i170 requires expensive materia to penta-meld (nightmare of the bank-breaking overmelds). i180 doesn't need any expensive meld. (iii) NQ i170 is significantly weaker than the other two, and should be avoided at all cost. (iv) i170 requires much fewer Red Crafter's Tokens, but requires a lot of Red Gatherer's Tokens to do "Favors" (nightmare RNG gathering). i180 requires a lot more Red Crafter's Tokens, but does not require Red Gatherer's Tokens at all. (v) i170 can be dyed into different colors, but i180 cannot. (vi) i170 can be sold on the market. i180 is unique untradable. I did my first 2-star item at 730 Craft, but you don't need 730! I don't know what's the lowest possible for the following completion Methods (1) & (2). But at least for Method (3) (Rath's rotation), you can have as low as the minimum of 718 Craftsmanship and still be fine! I did used Reclaim 2 times throughout the course of crafting all these gear for all 8 DoH classes (and the offhands for Miner & Botanist). Luckily not a single final product has gone NQ yet. If you do not have the required craftsmanship lvl, you can substitute Basic Touches with Hasty Touches, and spend that CP on a Standard Synthesis, replacing a Careful Syn II. However, the lower control will have to be supplemented by more BT->HT substitutes to buy stronger touches in the finisher phase (and you lose the fidelity). Thus, CP > control. Apart from high fidelity, another beauty of this rotation is that it's "Standardized". Unlike my usual Hasty Touch Rotation (11 touches) that requires much improvising, this rotation is simple and short, and you can just click through the buttons without thinking too much, and no touches will fail. This is a macro-able rotation, but I do not recommend doing it in a macro unless you have a crap load of mats to waste on. This rotation was streamlined-ly designed for people with very high stats, but does not require max melds on everything. As you can see below, I have max melded my Hat, Gloves, Pants, Boots, and near-maxed-melded accessories. But I have only added 4 CP on mainhand & offhand (Cunning III, I --> cheap!). And I have only added 18 craftsmanship on the chest with nothing else (Competence III, III, III, I --> cheap!). I did those cheap melds on chest and tools because I want to wipe and re-meld later with Tier V materia in the future. I don't even have the new belt yet, which would have provided me with the tad bit more control needed for 100% HQ rate. 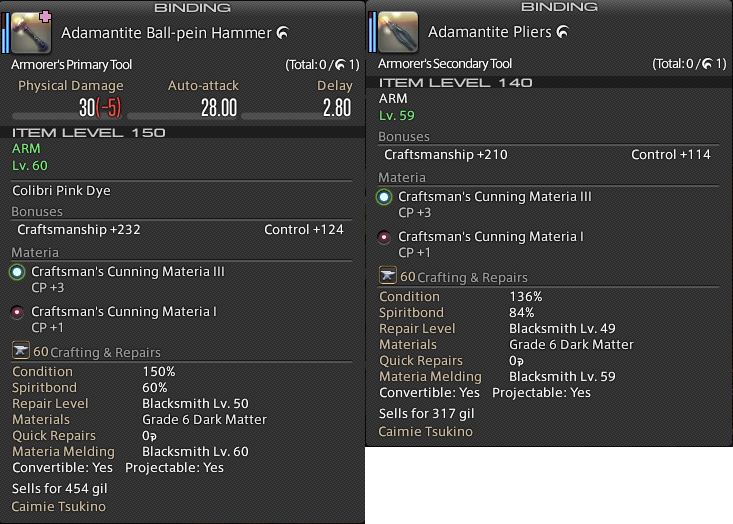 I'm just lacking 3 crafts here, which I could easily meld on a tool. My tools here are again only melded with 4 CP each. However, to do it with white gear would mean lacking much control. Thus, it will further depend on Precise Touches, and substituting Basic T's with Hasty T's to exchange for stronger touches in the finisher phase. By incorporating Maker's Mark, I generated a Low Craftsmanship version and a Low Craftsmanship/Low CP version of my high fidelity rotation for those who don't have the high stats. The actual craftsmanship requirement is unknown, but it's somewhere between 770 and 783 craftsmanship (possibly 780 or 781). CP can be as low as 407 base CP (+ the use of Seafood Stew HQ to reach 457), harboring 1 Hasty Touch in the rotation. You can have even lower CP than that, but you will need to use more Hasties. It also appears that these versions of my rotation actually provides slightly more quality than the original. These rotations can afford 1 failed Flawless Syn. There's either 1 Basic Touch at 90% or 1 Hasty Touch at 80%. So it's not 100% secure. But they're much more secure than spamming 10 Hasties. And if there's one Precise Touch, the product will very likely be HQ. You gotta admire how perfectly those Comfort Zones are placed. There are just enough steps to fully utilize 2x CZ. It doesn't mean the original rotation #1 was useless. #1 is still a faster version of it that does not depend on the luck of Flawless Syn. All steps are 100% secure in the original version. Here is another rotation that utilizes Ingen2+Name+Brand, which one-shots the item. This "Brand-Name" Rotation requires 857 craftsmanship (Thanks Blueruckus for this, and I have confirmed it myself). You can use Baked Onion Soup to reach this high craftsmanship level. The CP here has been customized for the use of the soup (it does NOT require 472 CP, which only Seafood Stew can provide). And the 3rd Insecure Variant of it can actually reach IQ9. Thus, you can get away with less control and achieve higher powers. But of course, the more power you seek, the less fidelity you have. Special thanks to my gaming partner Valestia for supplying me with a ton of Competence I materia for testing the minimum amt of craftsmanship for this! In order to benefit leveling crafters, I have included my crafting data here so people can know approximately what it takes to complete an item. Most data were taken from 495 craftsmanship. 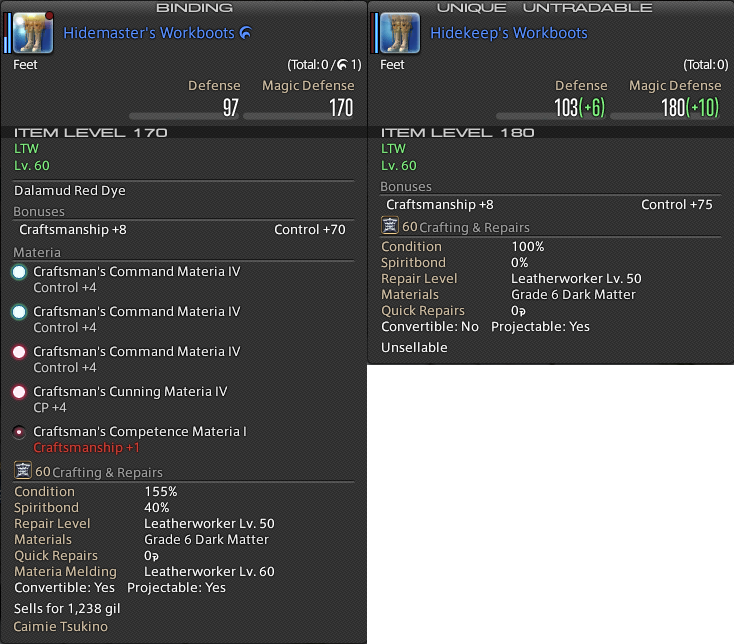 I was on Lucis mainhand and Artisan offhand most of the time, except a few data taken at level 59 or 60, which I swapped into a stronger offhand. At lvl 53, the original Nugget Rotation macro (6 touch, no hasty) gives 80% quality. At lvl 53, the 365 CP version of Nugget Rotation (eaten a Stone Soup) macro gives 100% quality. When craftsmanship >670, 2x CS II alone will complete the item. Name of [element] (15 CP) + Brand of [element] (6 CP) --> 1 shot complete! 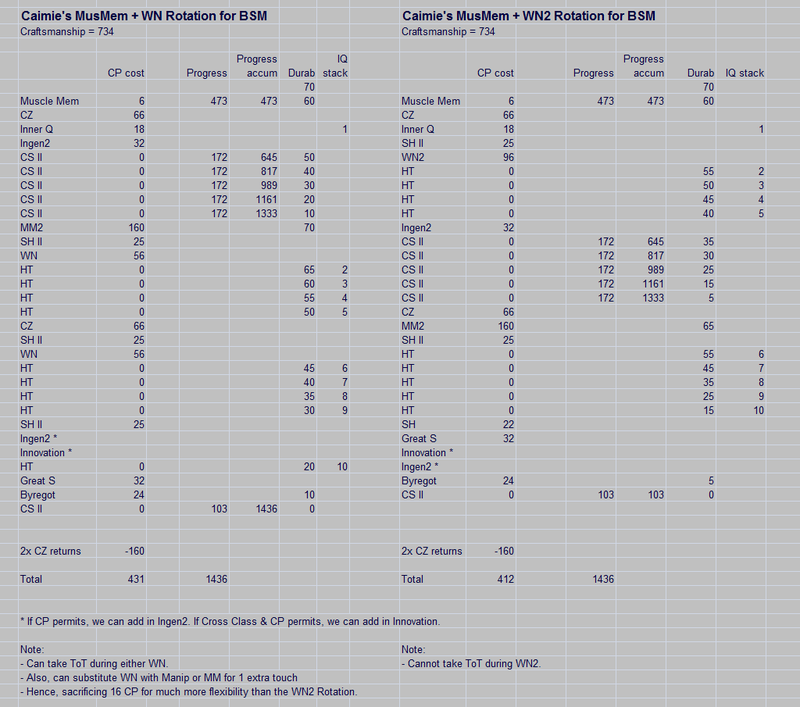 CS II gives 206 progress (need MusMem + 3x CS II to complete) --> ideal! CS II gives 207 progress (need MusMem + 3x CS II to complete) --> ideal! (Name+Brand of Water + 2x CS II to complete) --> ideal if you have less craftsmanship! If you have not reached level 50 yet, please visit Part 1 of the guide for helpful information concerning old ARR contents. Lliana Hylrin, Kasier, Culfin and 9 others like this.